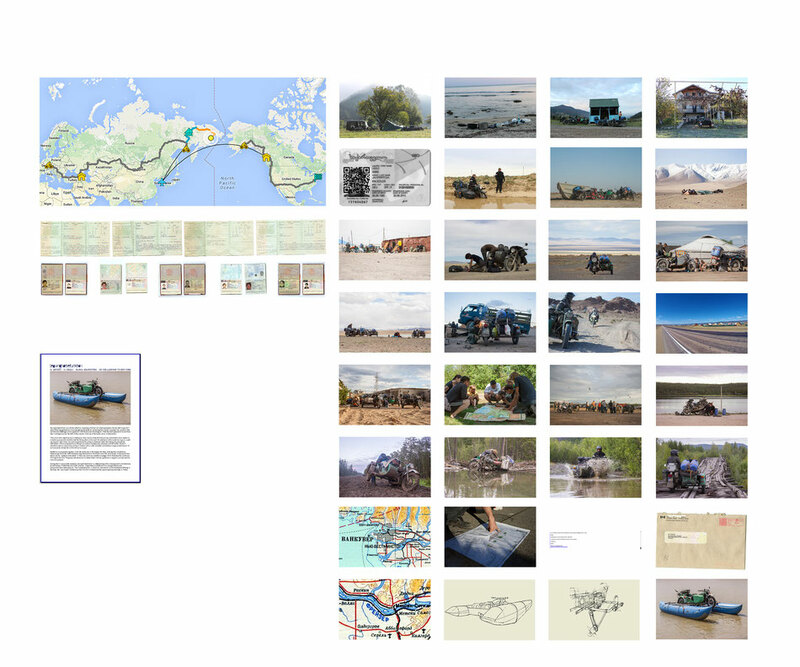 Through a 45 min presentation of our journey we introduce the reasons behind the leavinghomefunktion expedition - overcoming challenges like the swampy terrains of the Old Road of Bones or building an Amphibious Ural in order to "drive" a 1000 mile river up in the Far East of Russia. 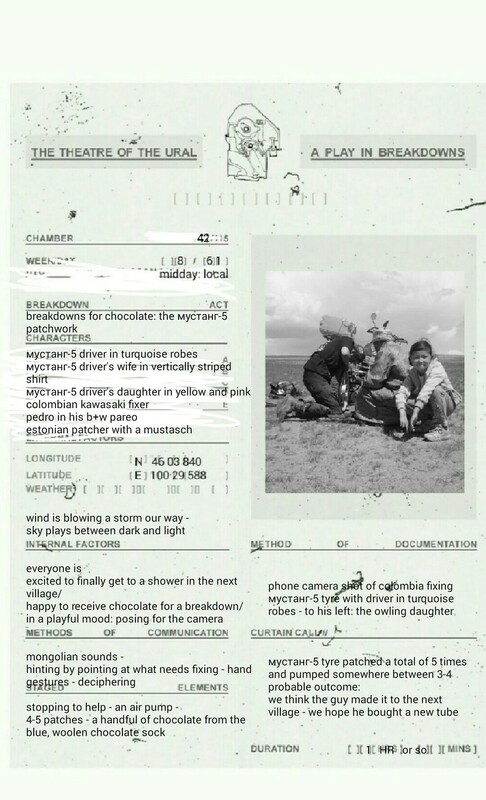 Beyond the physical adventures come the mental challenges where we leave behind our stability, our privacy and comfort zones in order to publicly find solutions to the obstacles we meet on every continent while trying to reach the ideal "New York, New York". 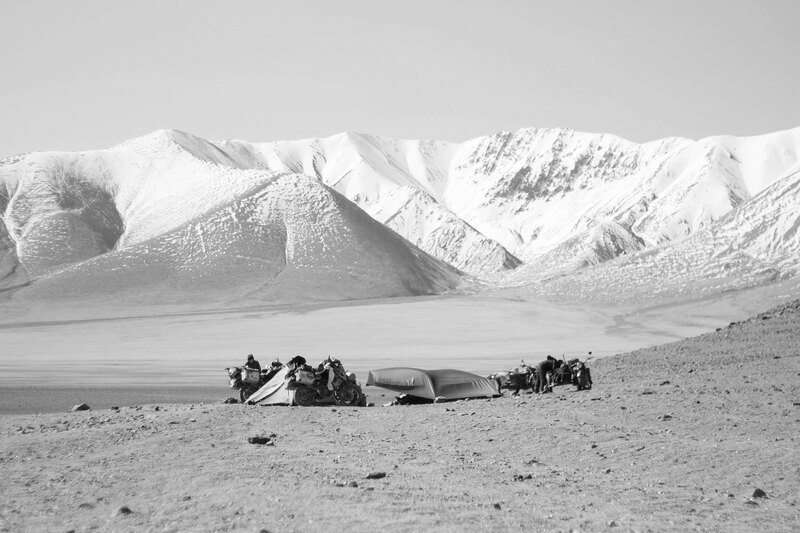 Through our presentations we aim to open up people to the values of coming in contact with new territories and cultures and furthermore to talk about how we challenge our own boundaries, create adventures and build new experiences. 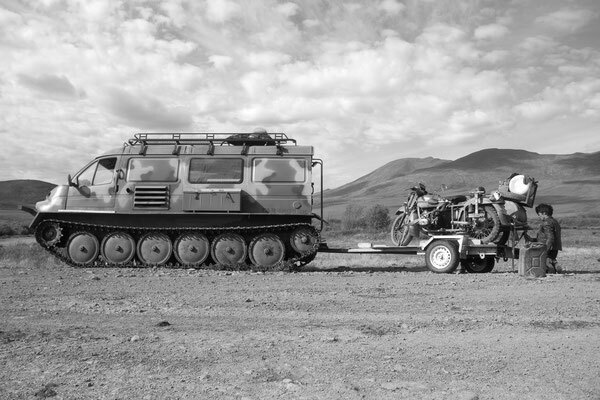 For the last 2 years we've been on a journey of the longest way East to reach the West. 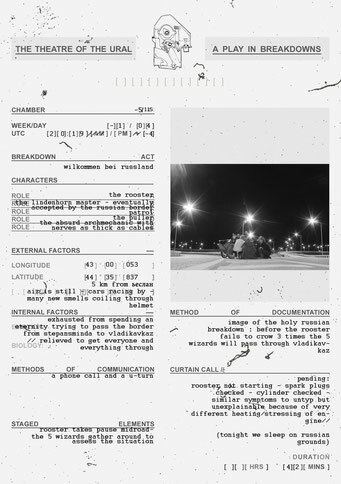 During this time we've been in a constant shift between trying to adapt and immerse ourselves in new territories and trying to move forward towards our final destination NYC. 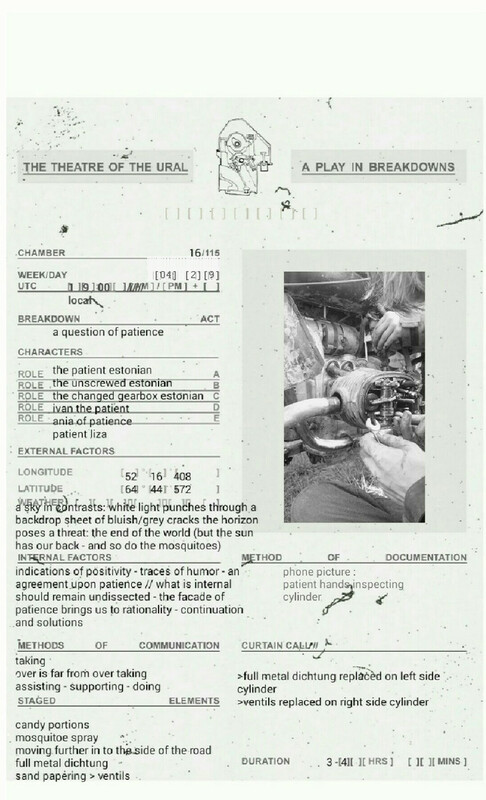 We have exported our private daily routines into a constant state of public. 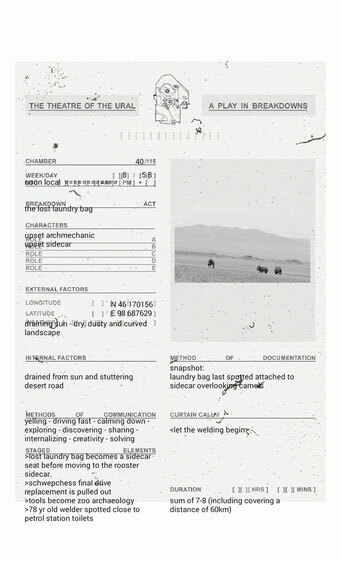 Beyond leaving our bedrooms, apartments and studios we do not travel from motel to motel. 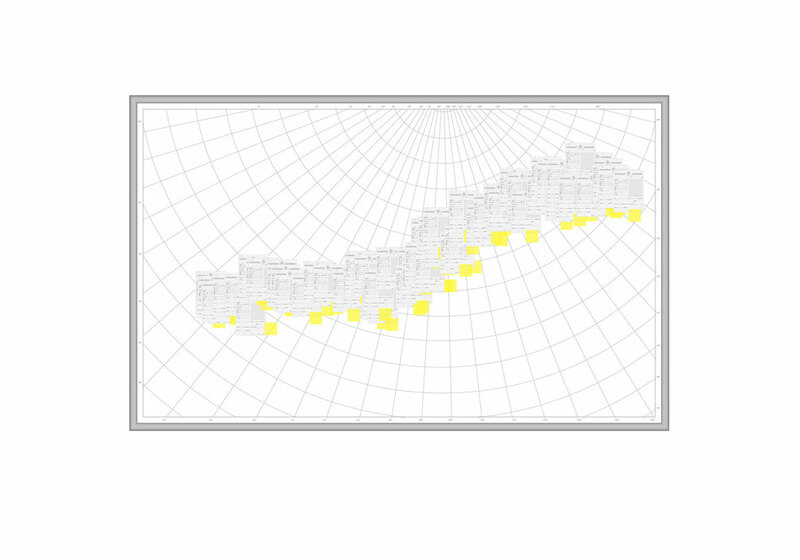 We have subtracted the “safety” which is brought from having walls. 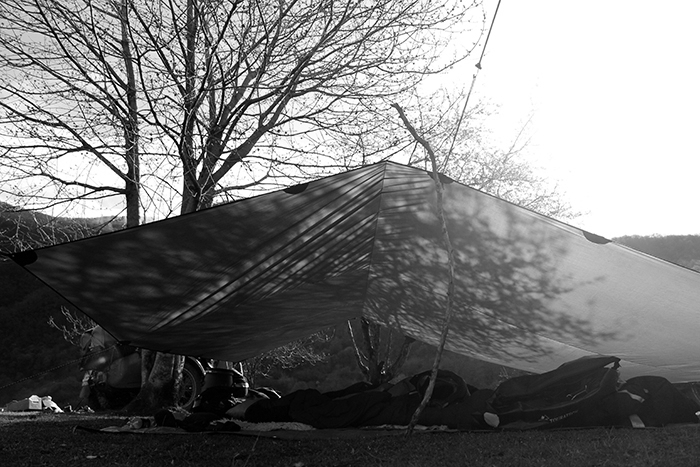 Every night we arrive at a new landscape - a new ground on which we plan and construct our temporary living space. 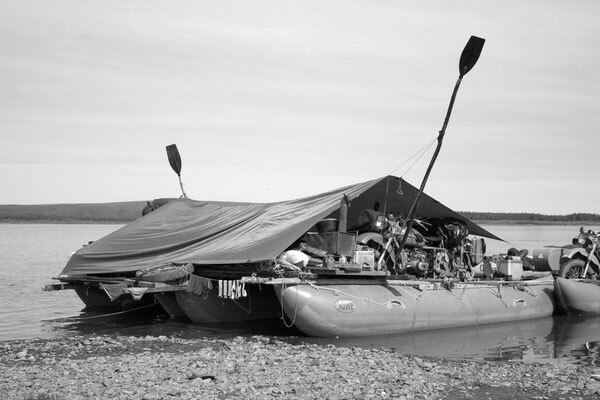 Based on the given resources we set up our ceiling (the tarp), our floor (the foil) and our beds (the sheepskins). There are no barriers between exterior and interior, private and public which sometimes exceeds to the extreme of breaking the borders of yours and mine. 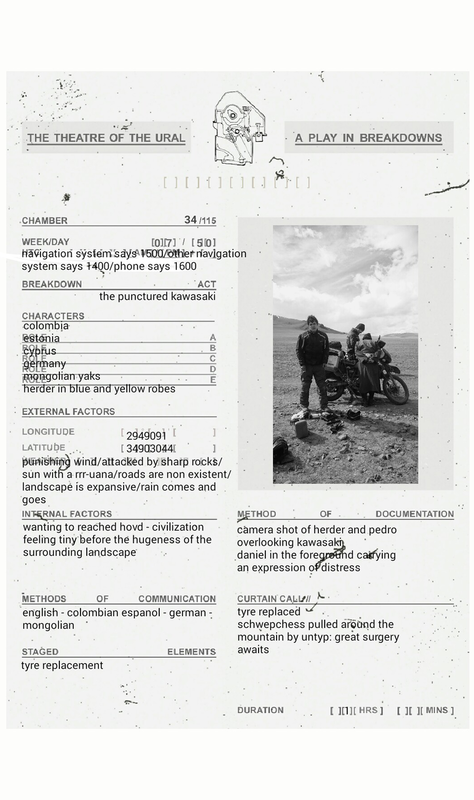 Through the leavinghomefunktion expedition we've been creating an open space which sets the base for exchange with foreign regions and their inhabitants. Now that we are back in Europe we are looking to temporarily occupy local Artists spaces where we can open up a dialogue about the transitions between private and public. 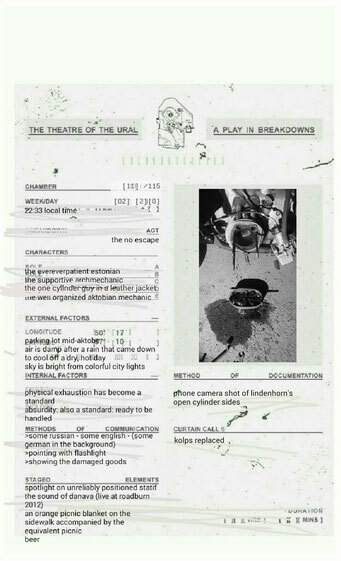 During a series of pop-up events we want to expose our temporary living conditions and daily routines while sharing a transcontinental hurricane of countless meetings, breakdowns and cultural diversities. 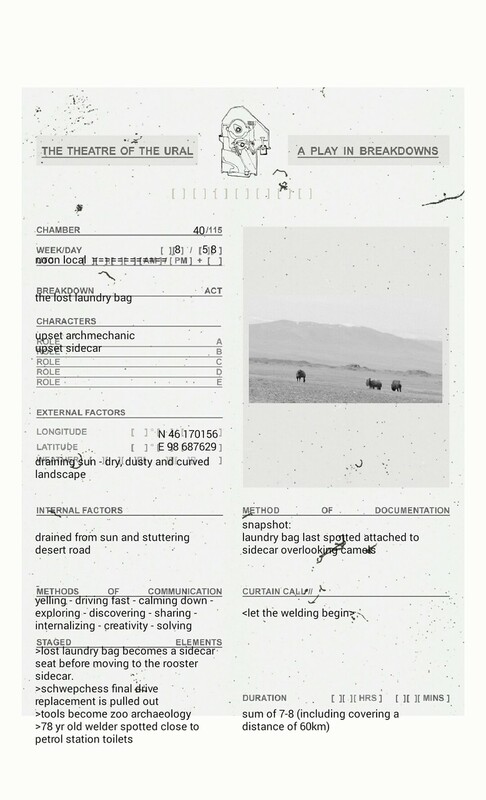 >> we are 5 artists. 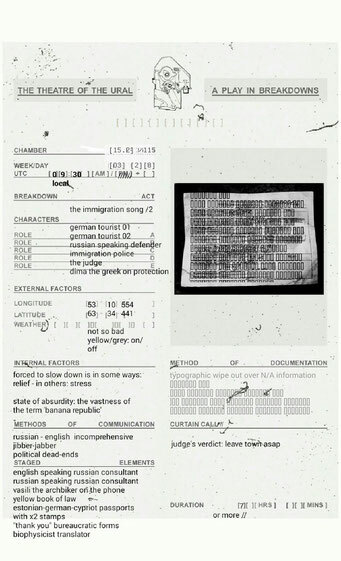 we are from estonia, germany and cyprus. 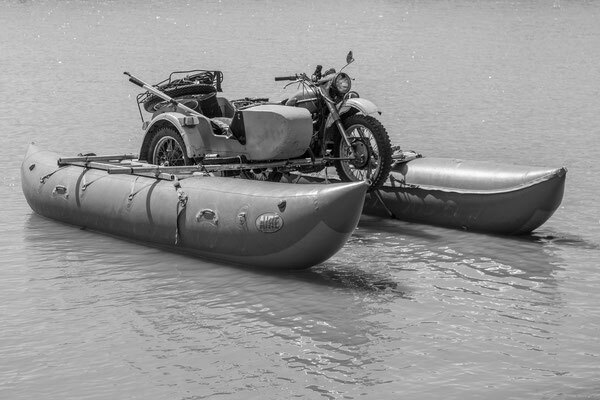 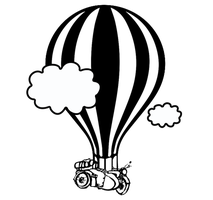 2014 we started an expedition with sidecar motorcycles. 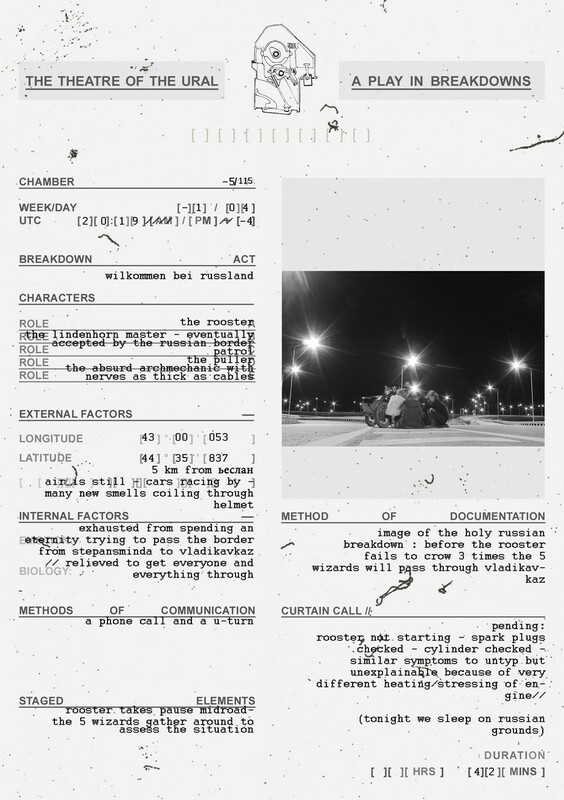 what does it mean to leave home? 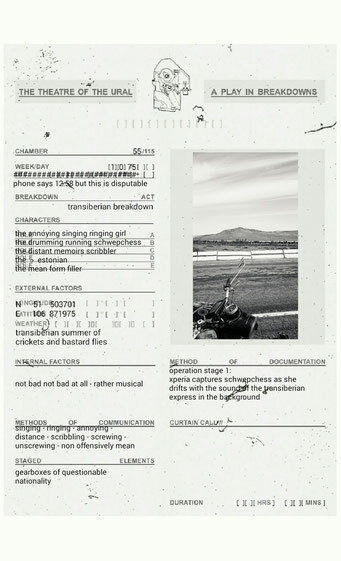 the world is our mobile studio. 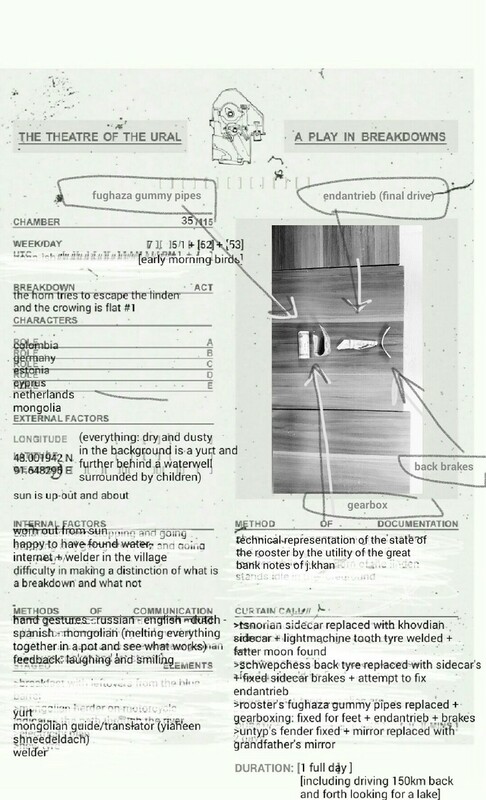 For every day of the SINOP BIENNALE our repetitive automated recording would develop through the progress documented within the 160 characters available on a satellite phone message. 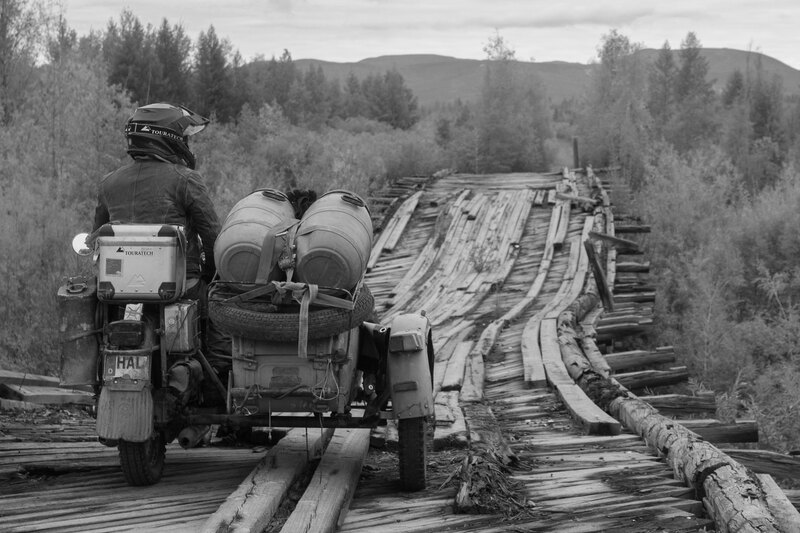 Within these 160 characters we aimed to explain the conditions of being in the remote regions of the Russian Far East, driving on the river with our self-built Amphibious Urals. 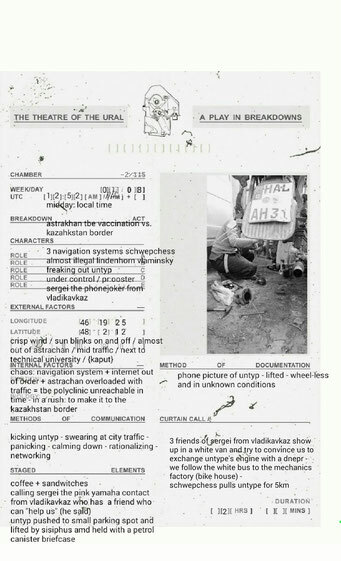 This experimental work continues to touch upon matters of social networking in overpopulated and hi-tech oriented regions and face to face networking in isolated and physically inaccessible regions. What we were interested in studying through this exhibition was the audience's relationship to social media platforms as they shift between the privacy of the laptop screen and the public exposure of the TV screen. 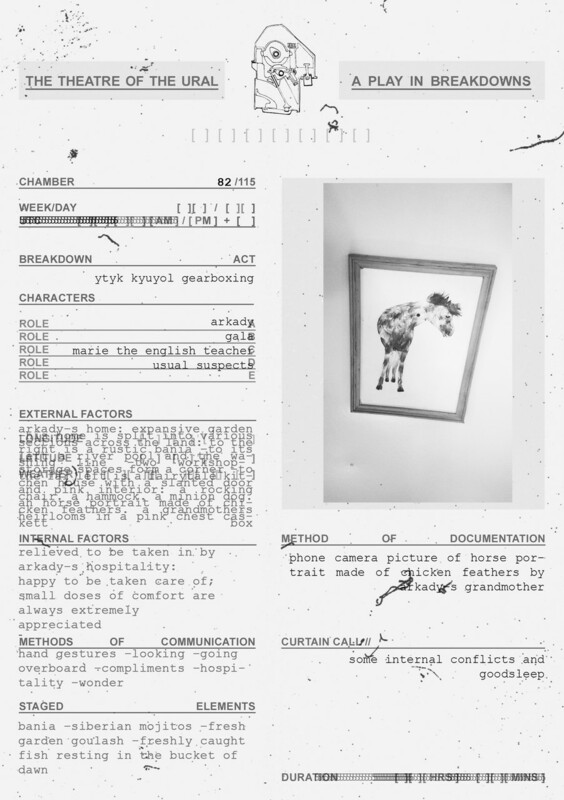 >> Laptop: should be representative of a persons private space : should be facing the wall and 1.5 meter distance from the wall. 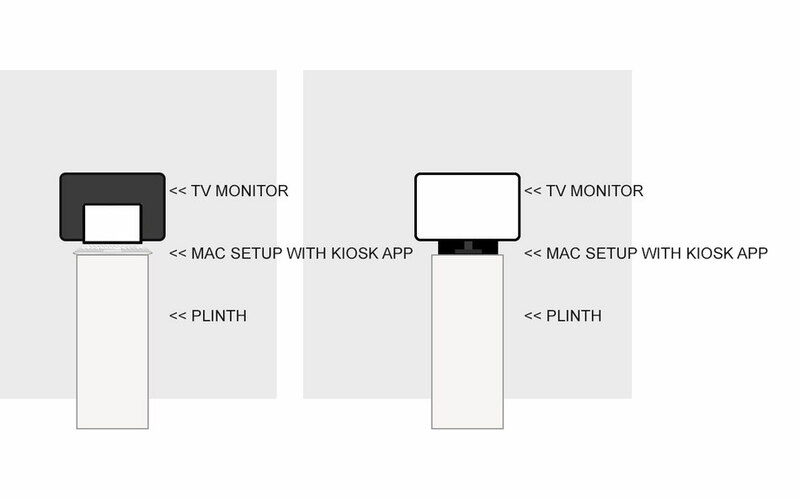 >> TV screen: (as big as possible) should be representative of a private space exposed to the public and should be facing the rest of the room. 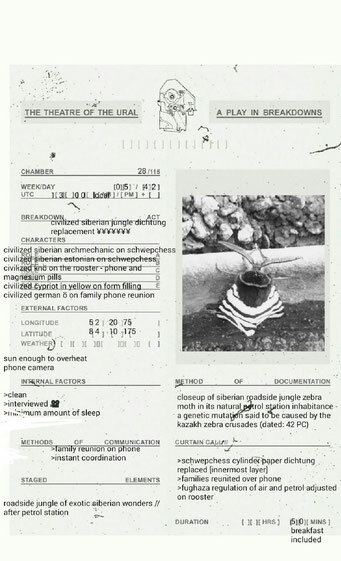 >> Juxtaposition in space: All ingredients should be placed on a plinth at an average human height level and should have a 1.5 meter distance from the wall. This will ensure that the person has enough space to stand behind the laptop and that the privacy of the laptop is not physically invaded - this should only happen digitally on screen. 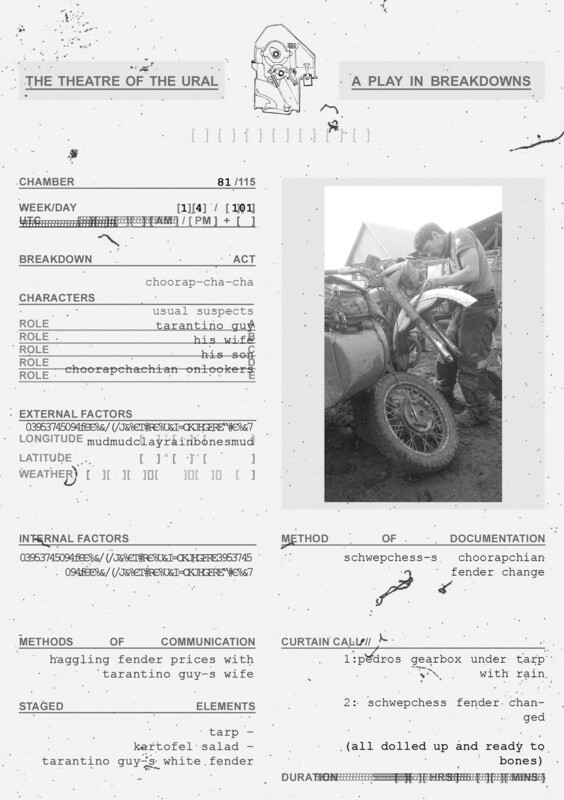 > We propose to conduct a research in order to analyze how we assume roles in breakdown situations and how such assumed roles interact, inform and influence both learning and solving processes. 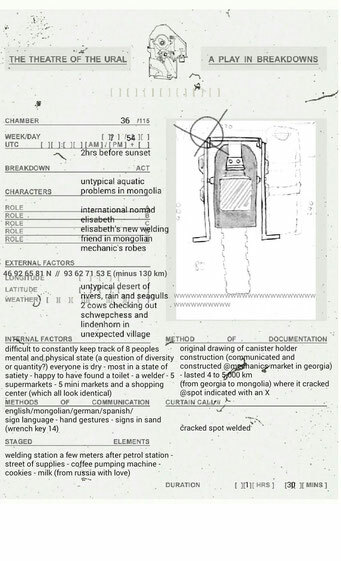 >Our assessment form has been designed in order to question research methods. Within the boundaries of an imposing, bureaucratic appearance it speaks in a language which bounces between mythology and science. 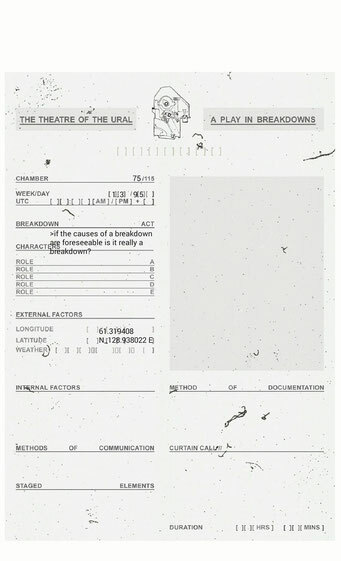 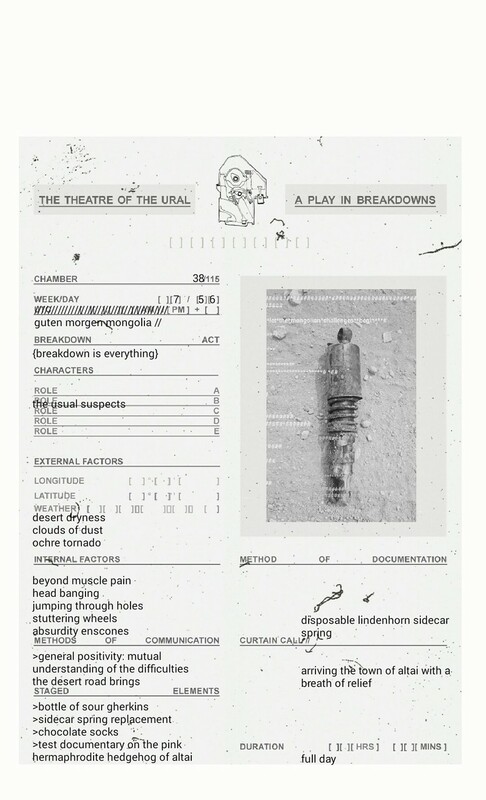 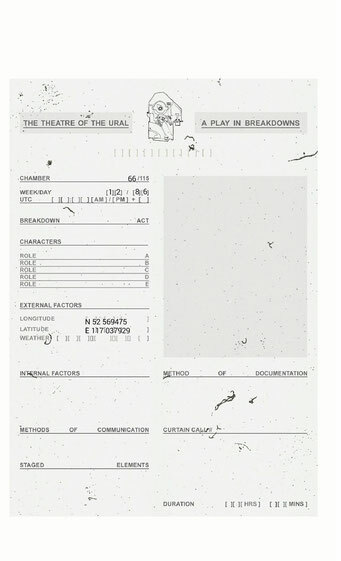 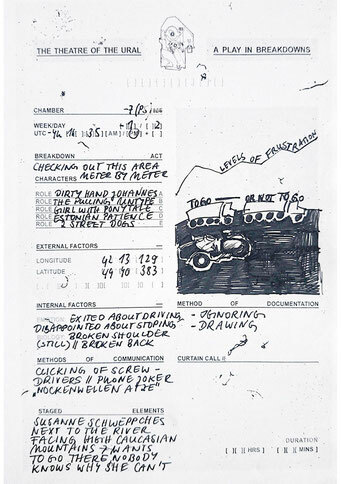 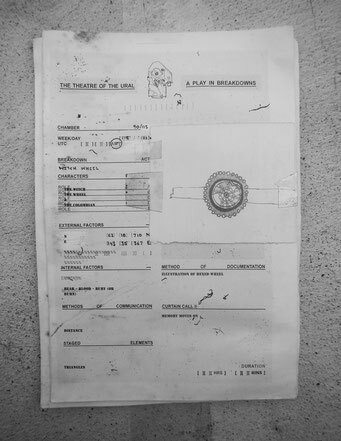 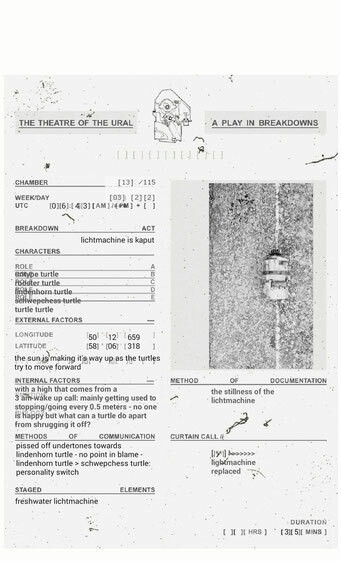 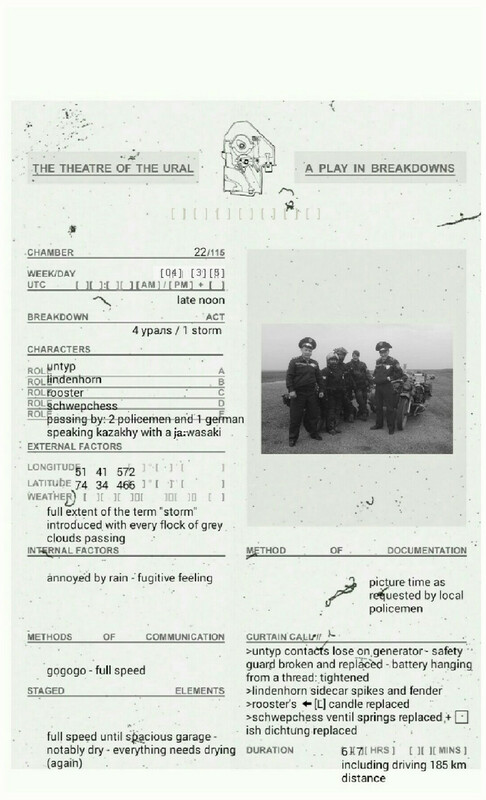 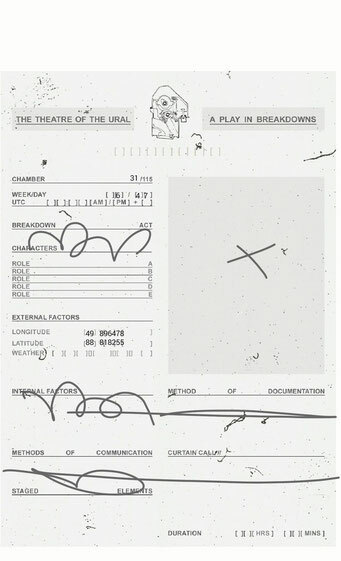 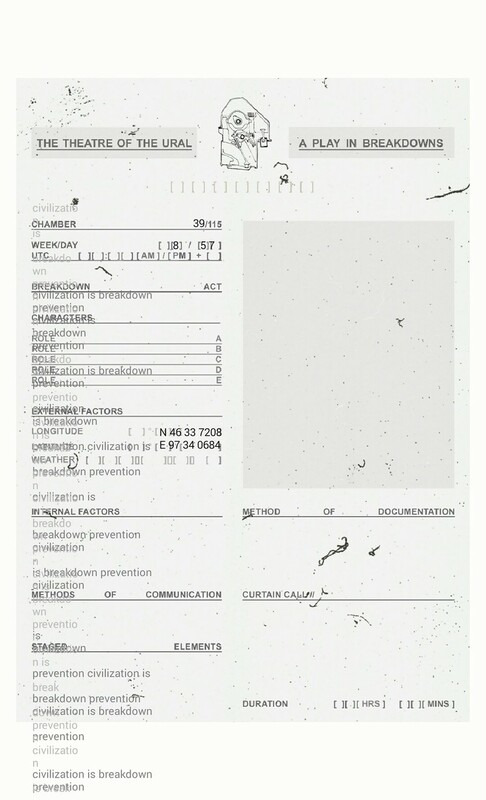 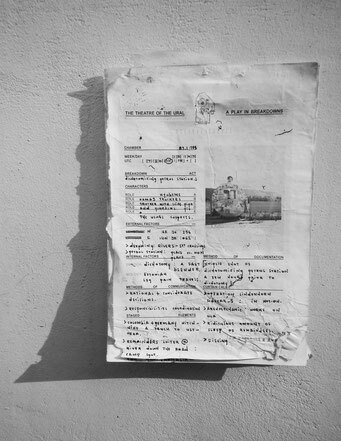 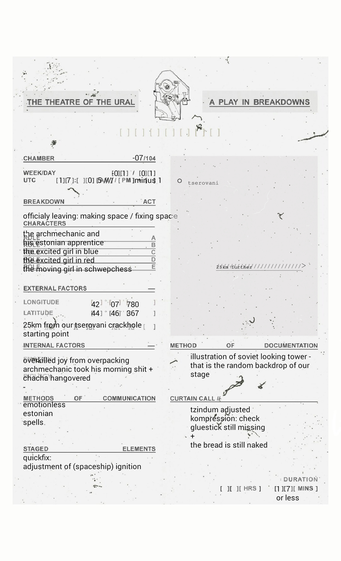 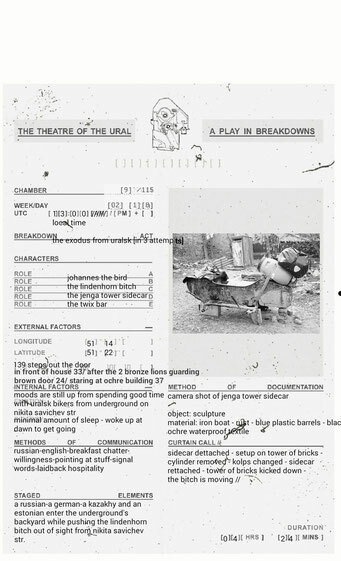 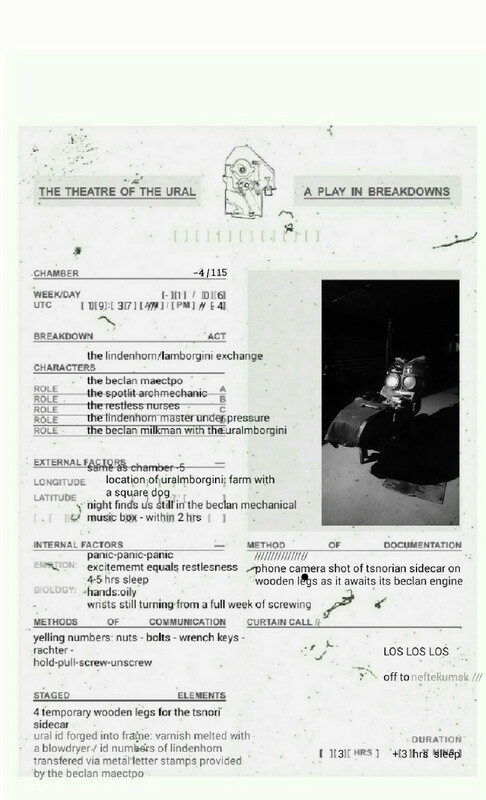 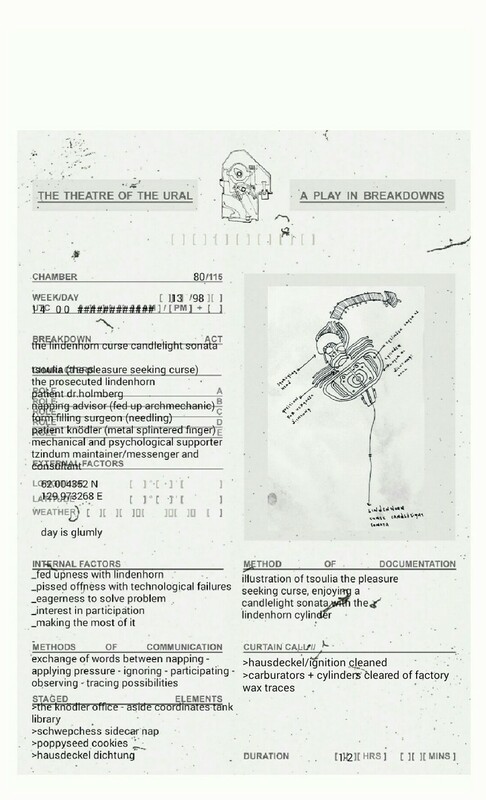 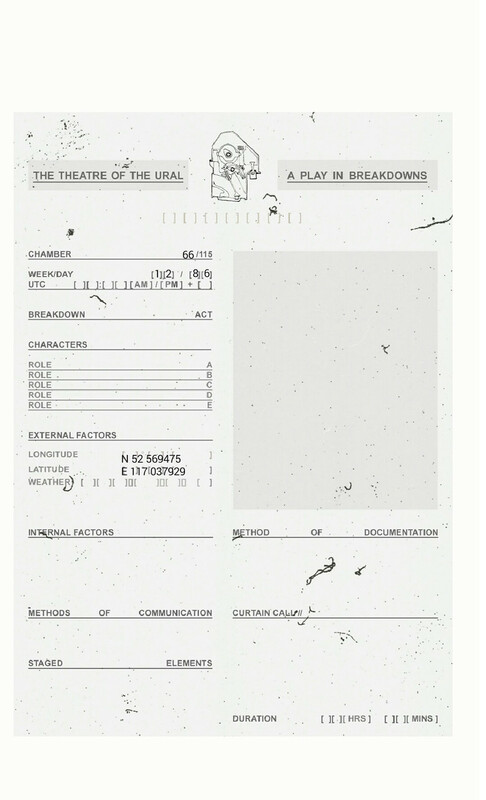 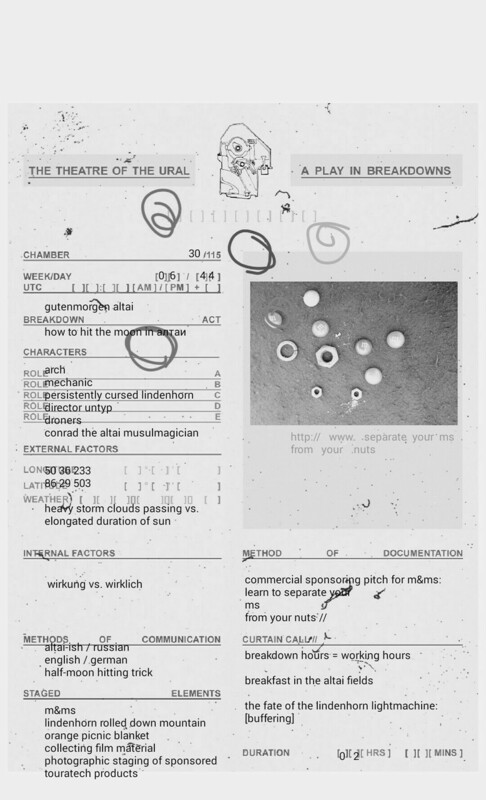 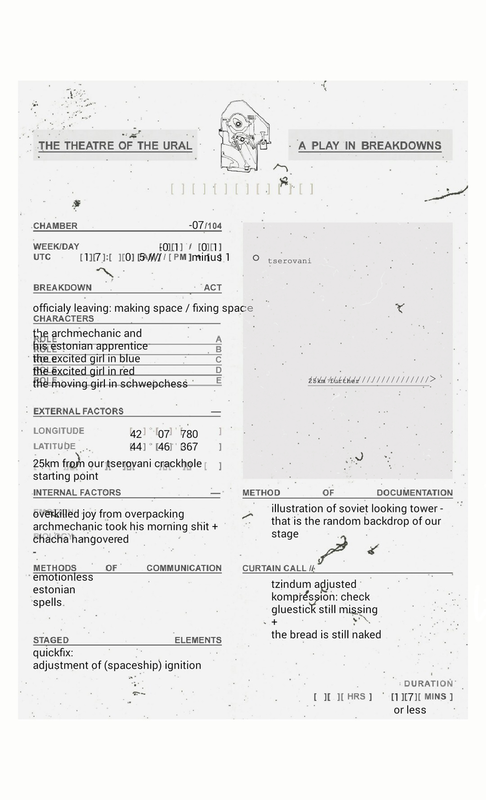 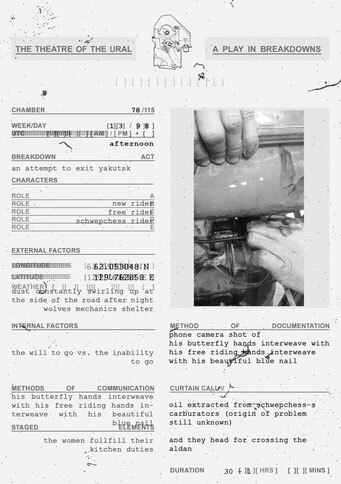 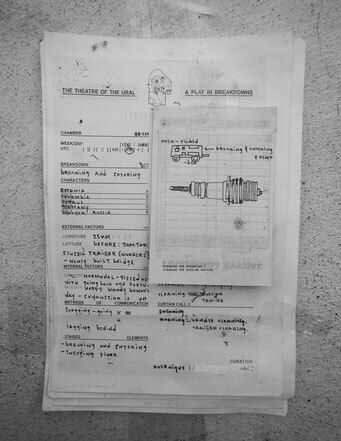 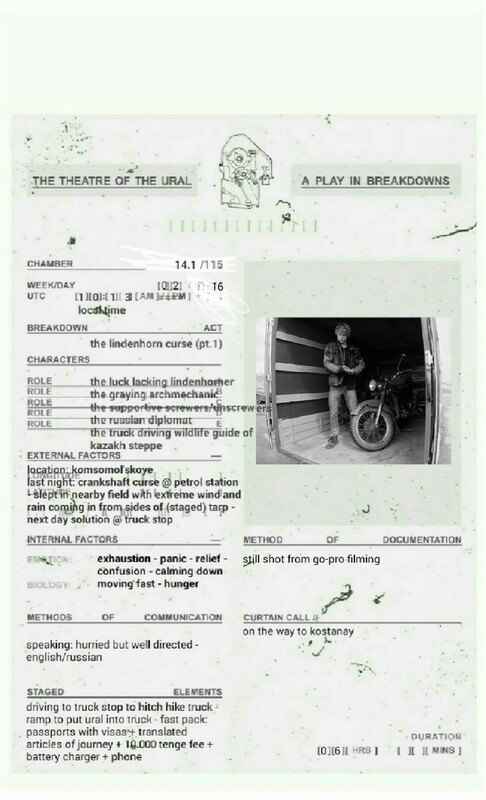 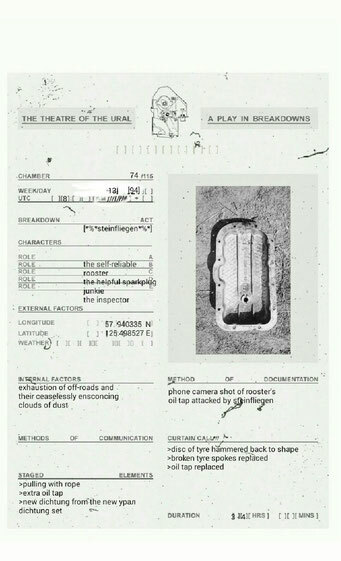 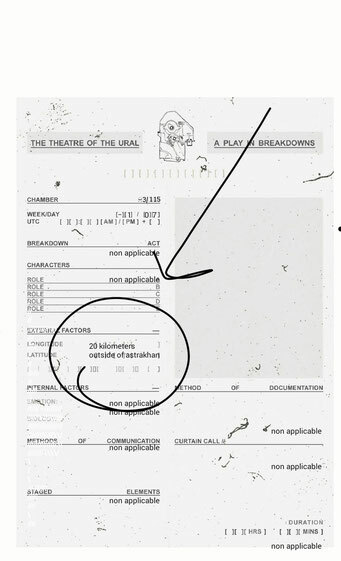 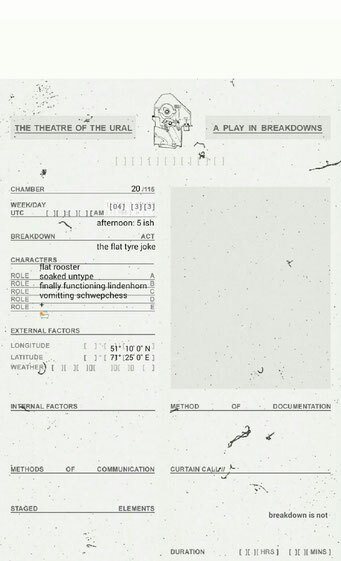 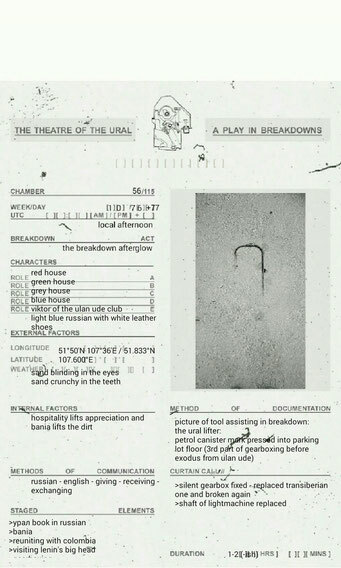 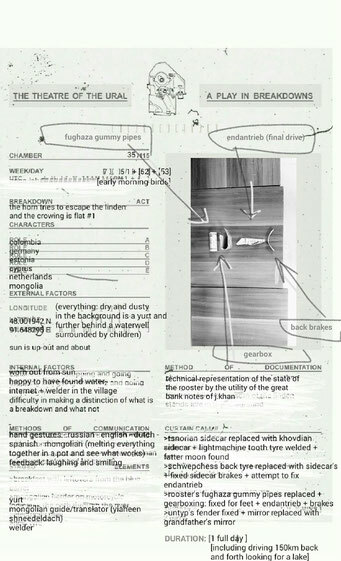 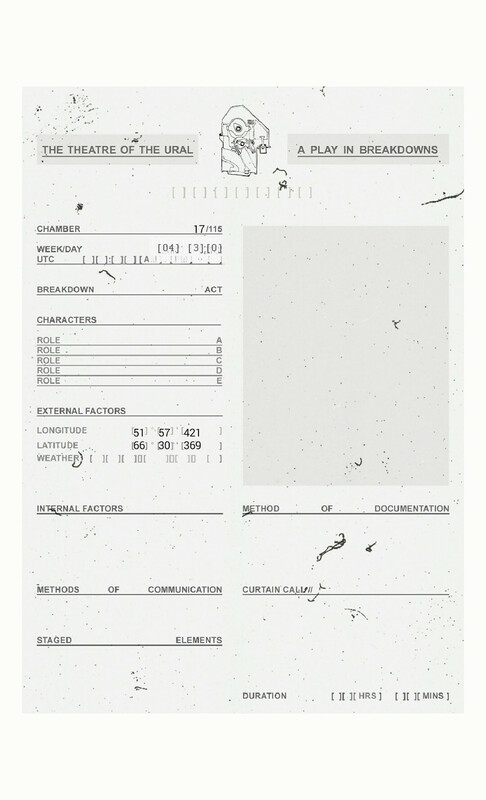 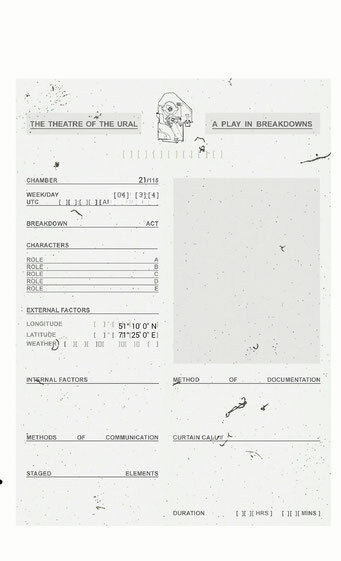 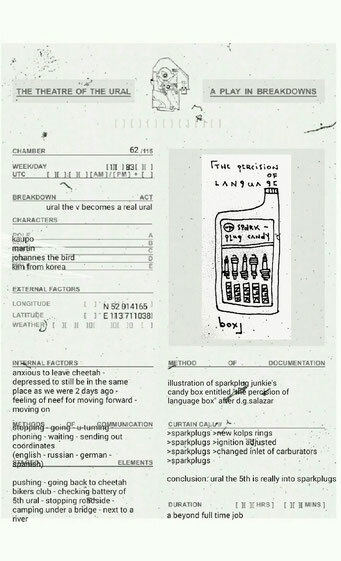 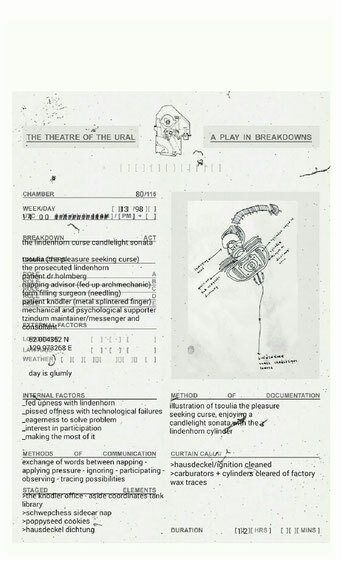 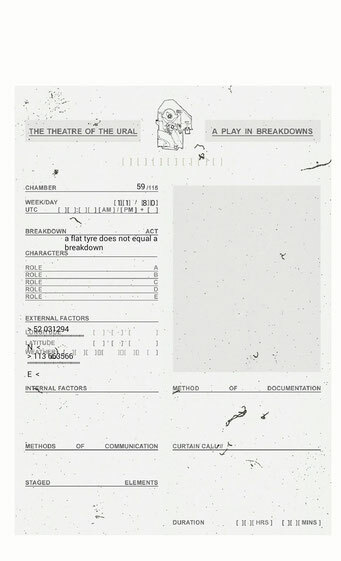 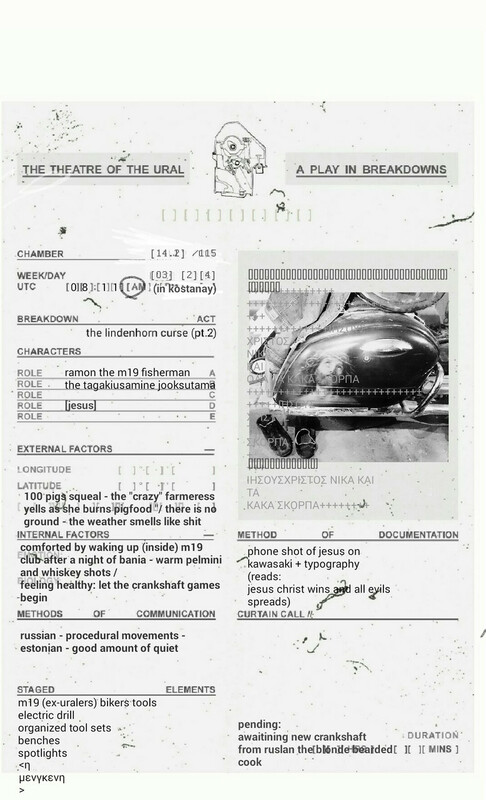 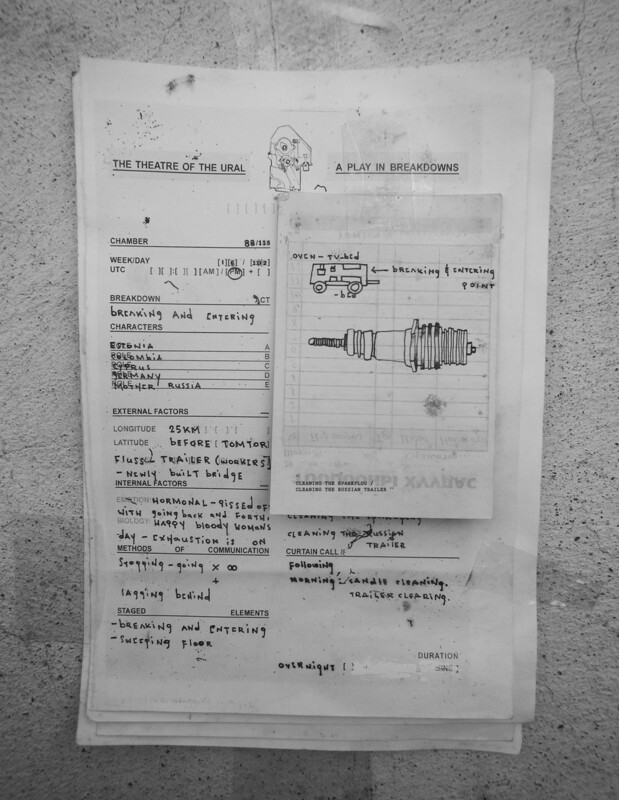 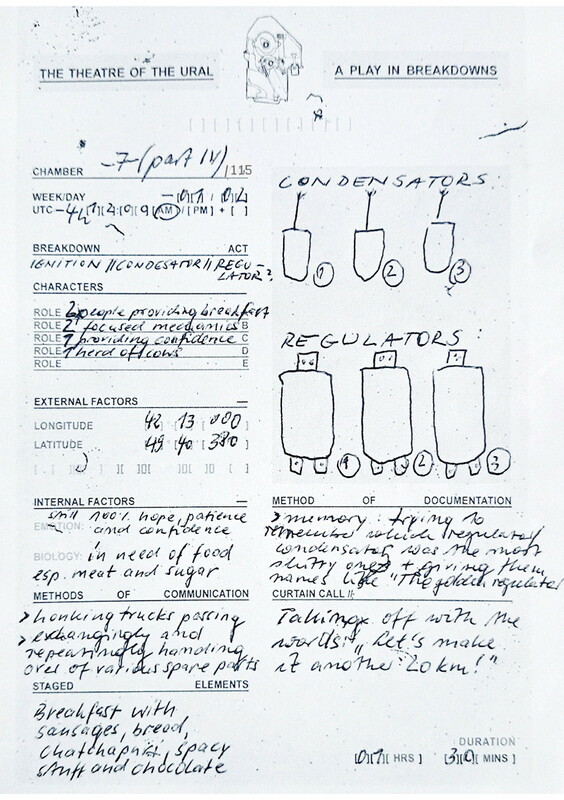 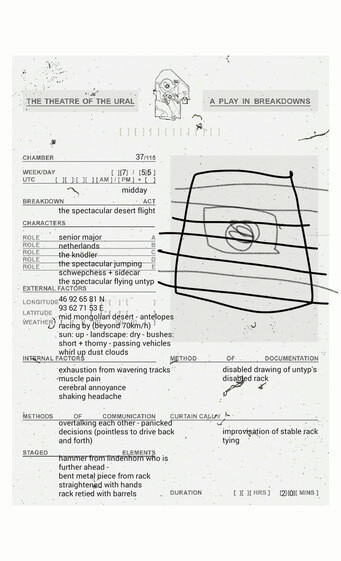 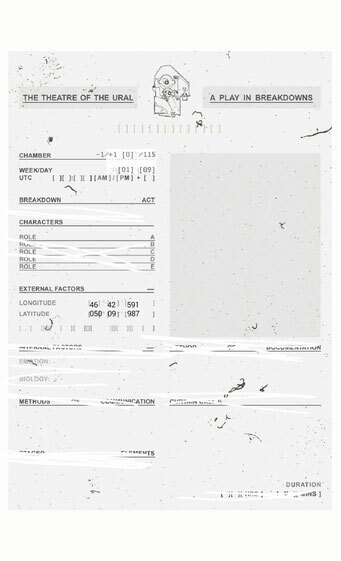 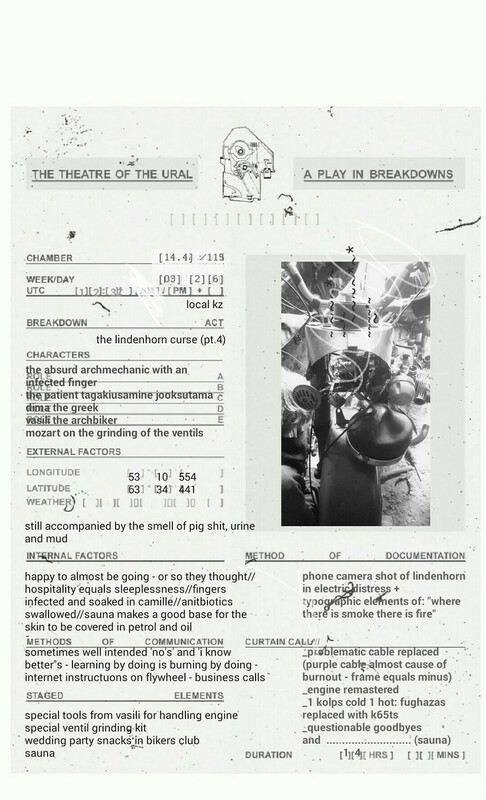 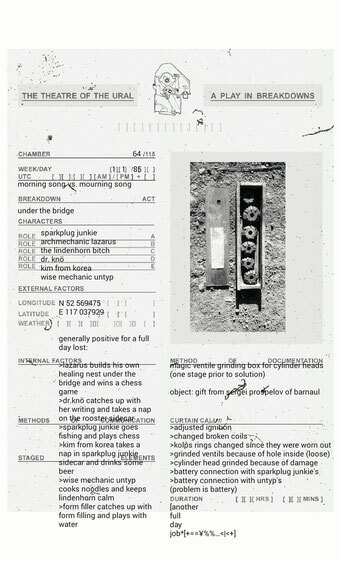 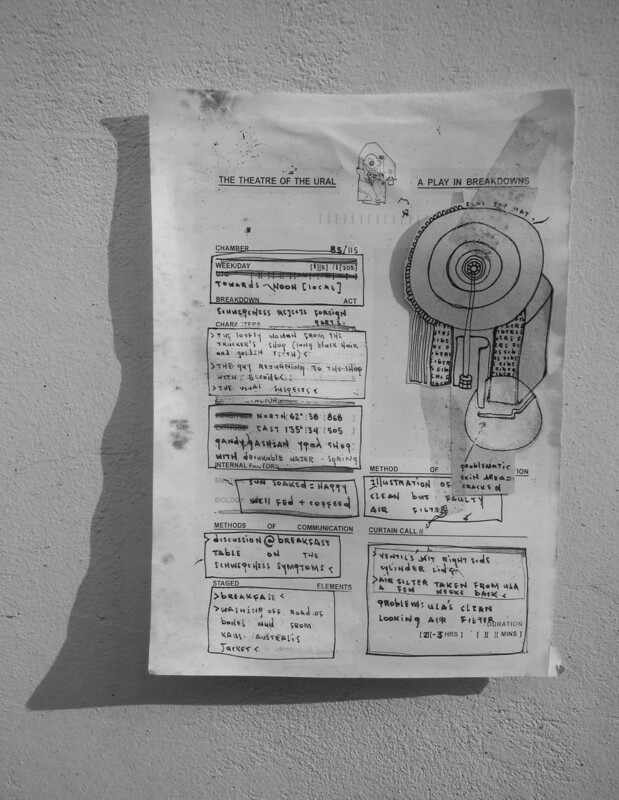 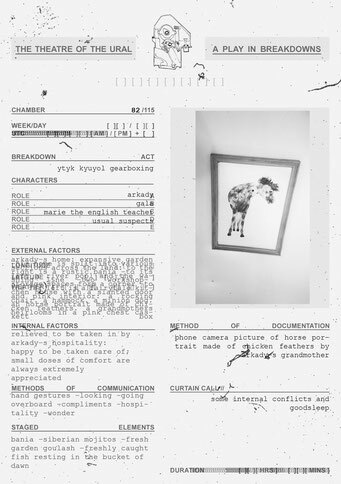 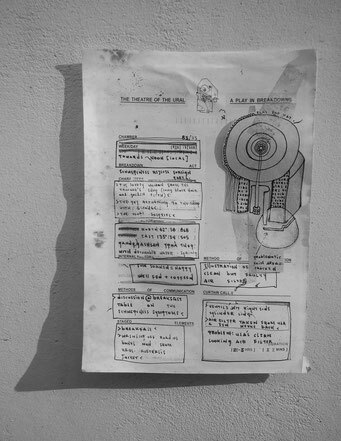 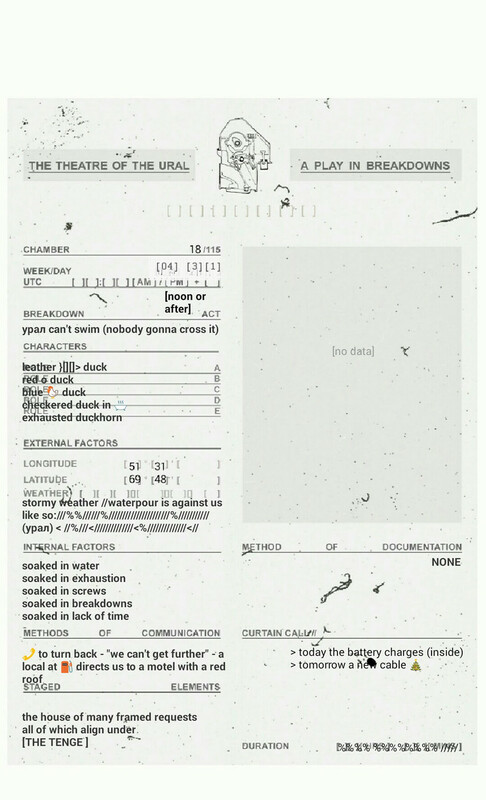 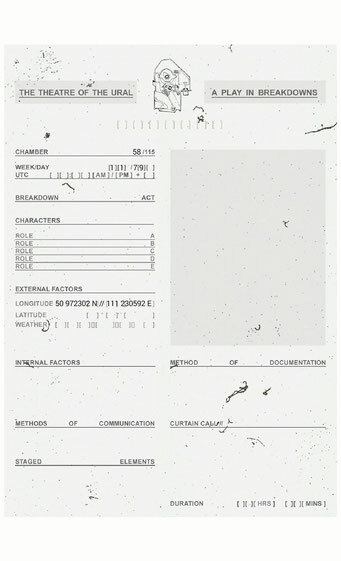 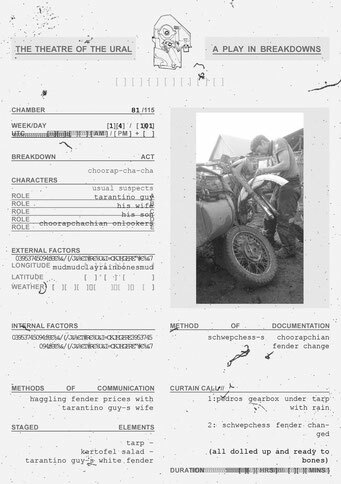 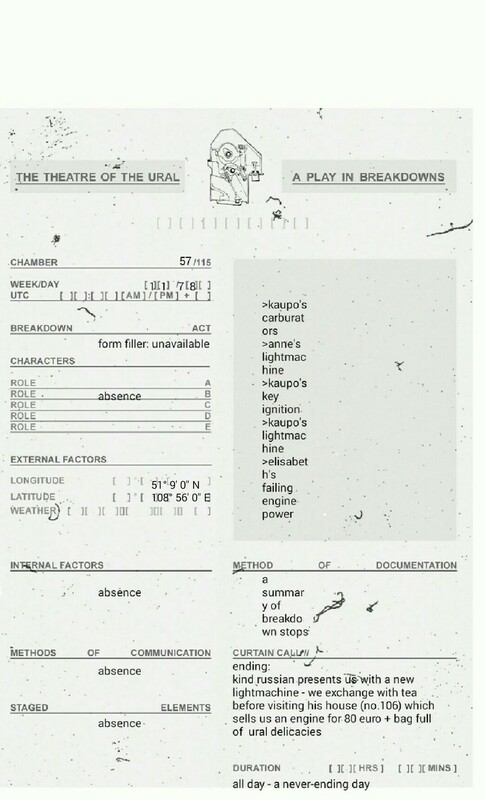 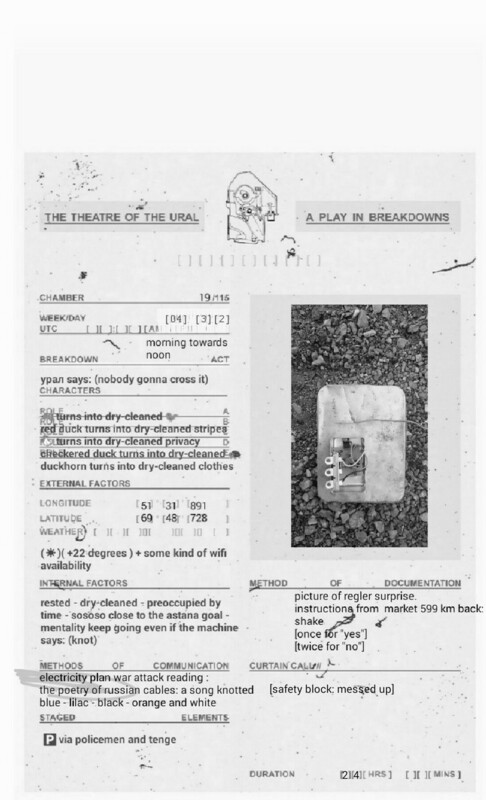 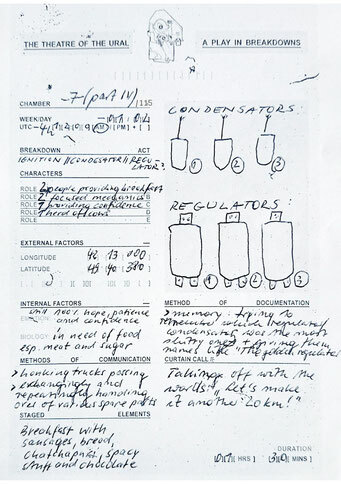 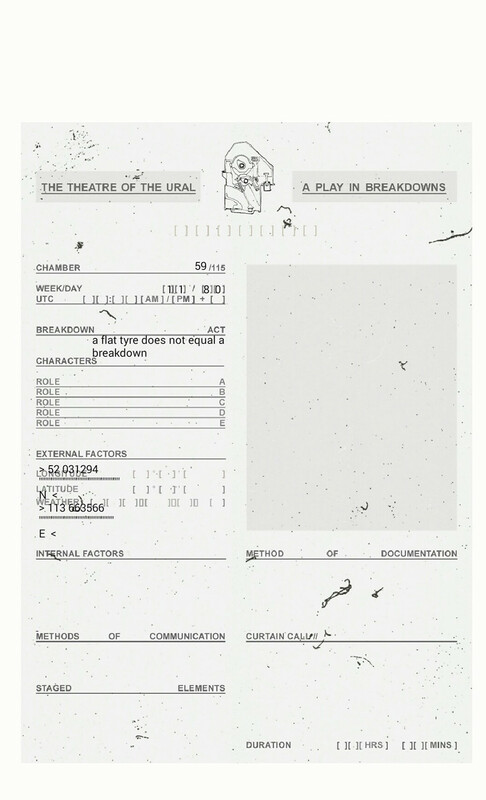 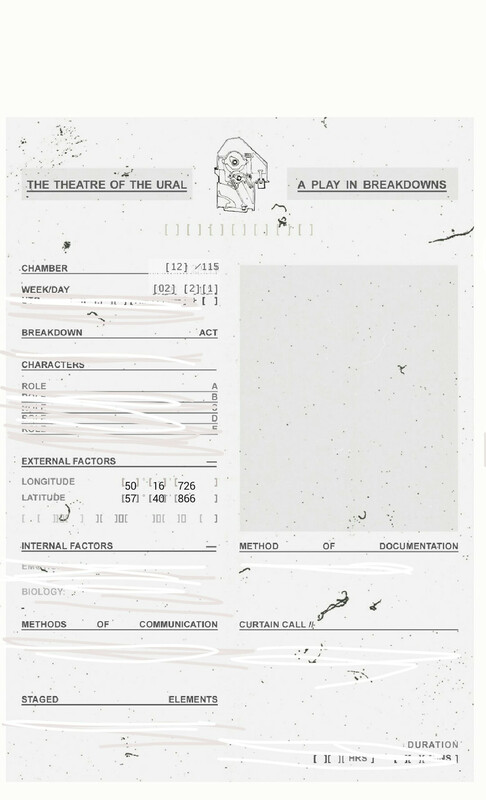 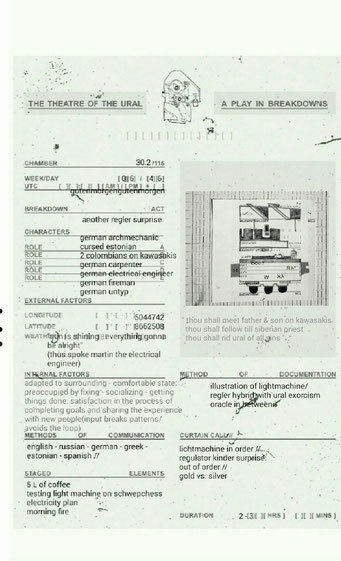 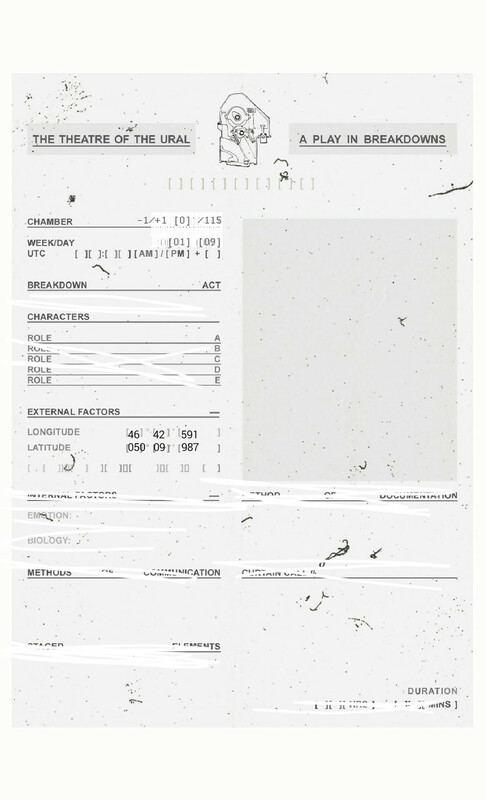 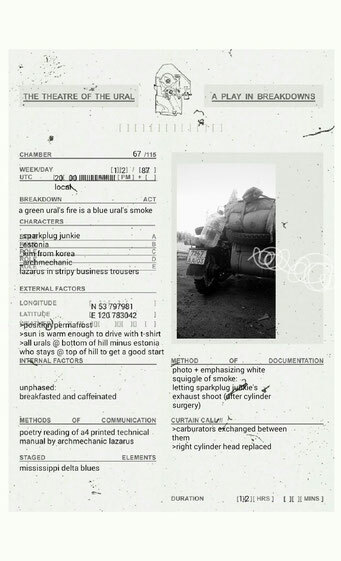 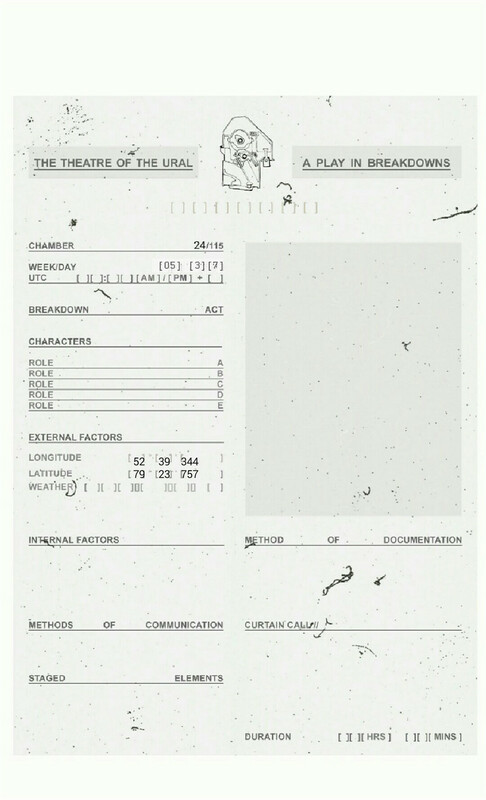 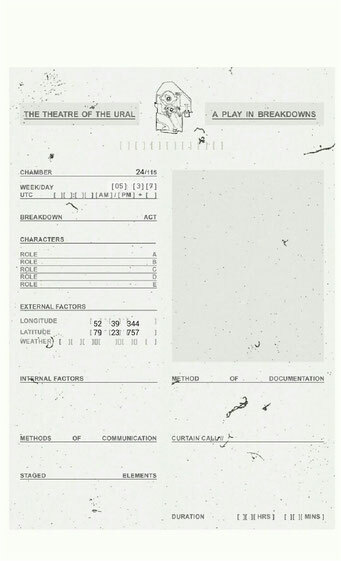 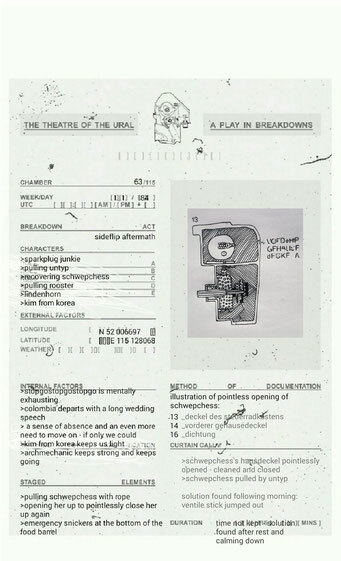 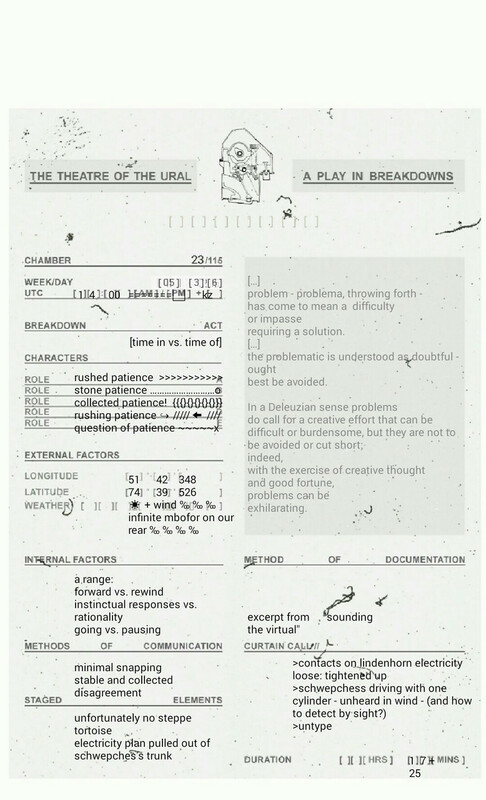 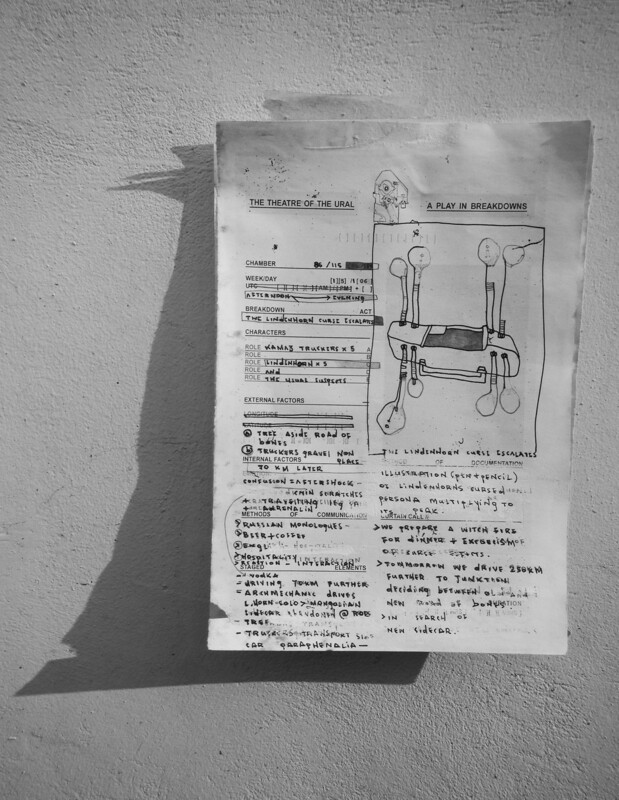 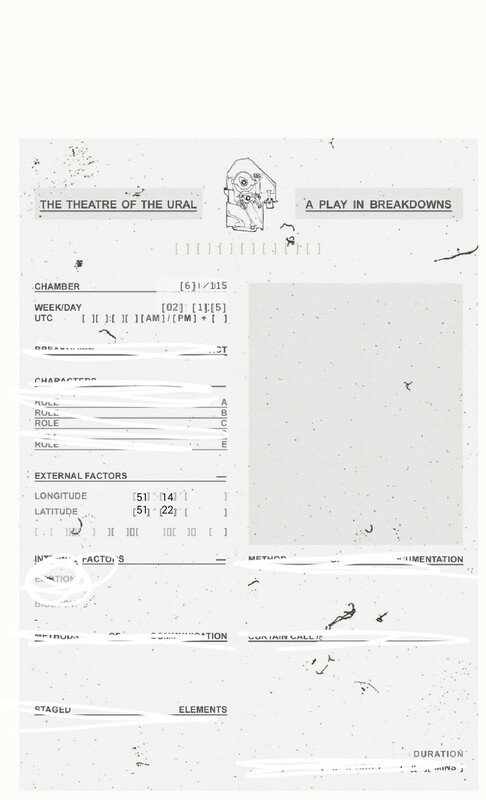 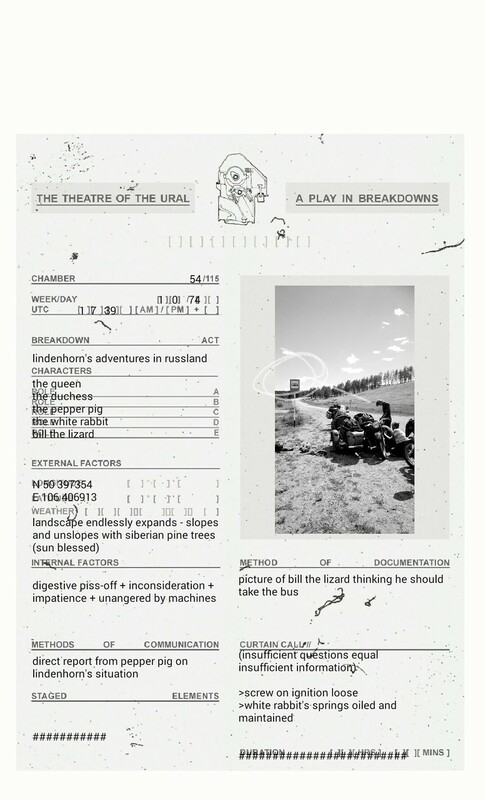 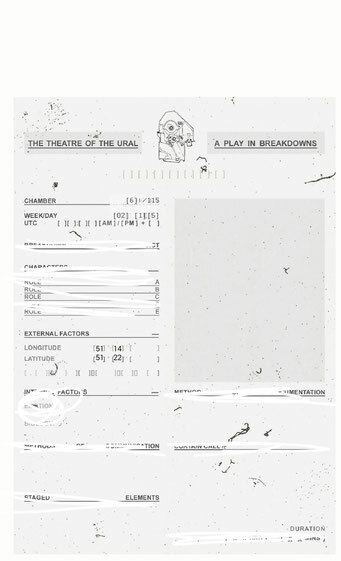 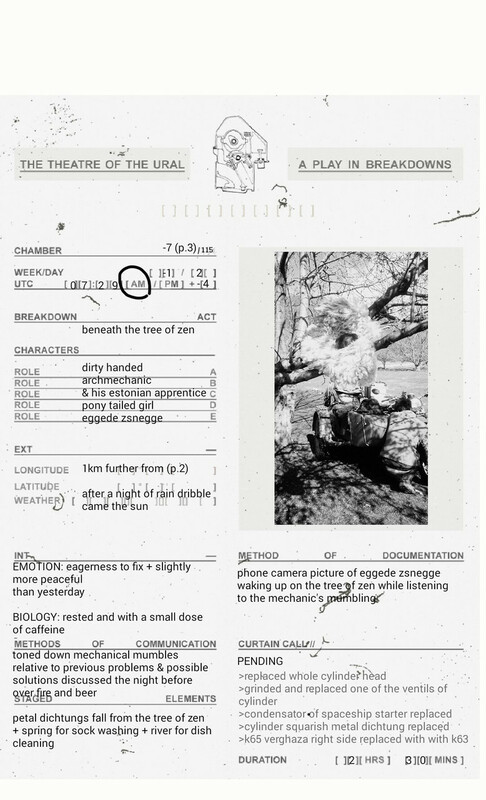 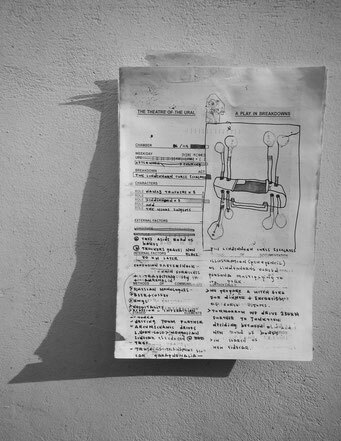 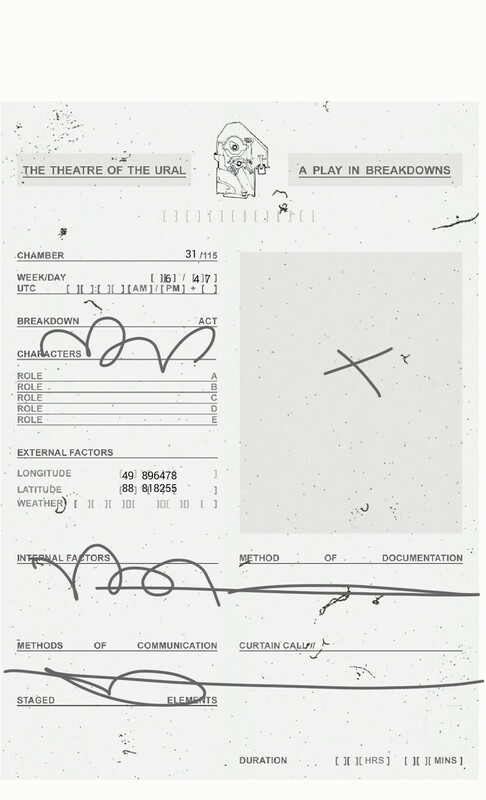 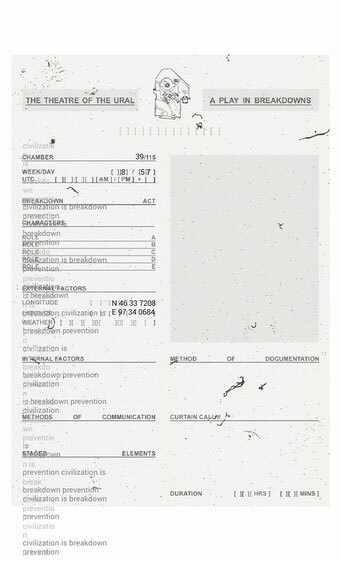 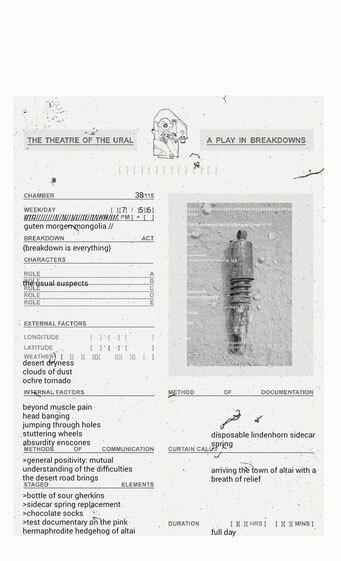 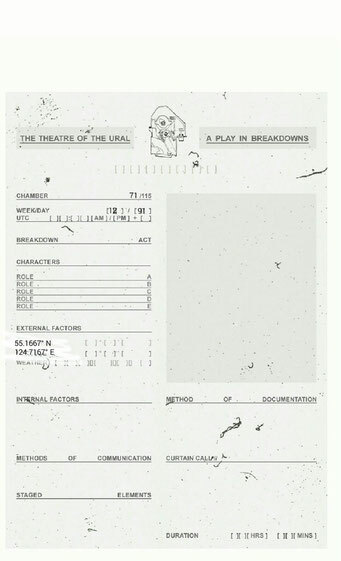 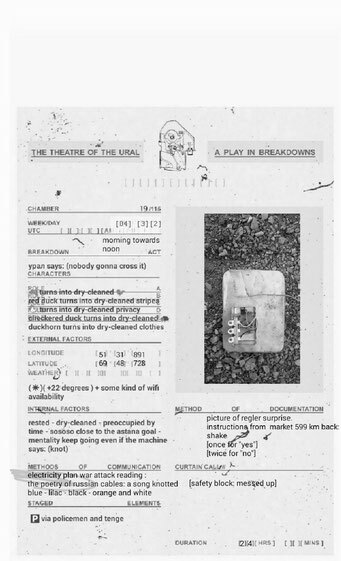 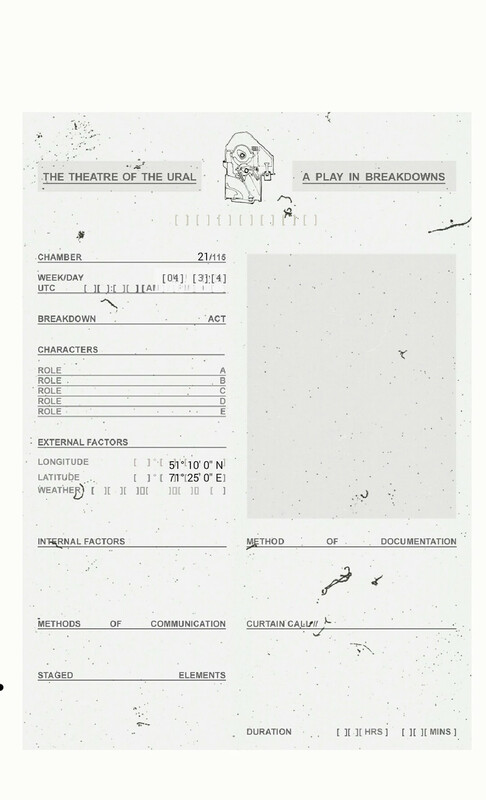 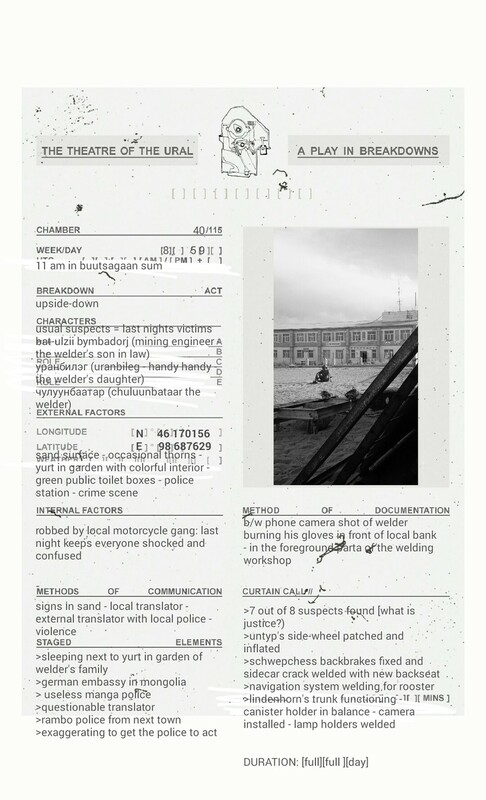 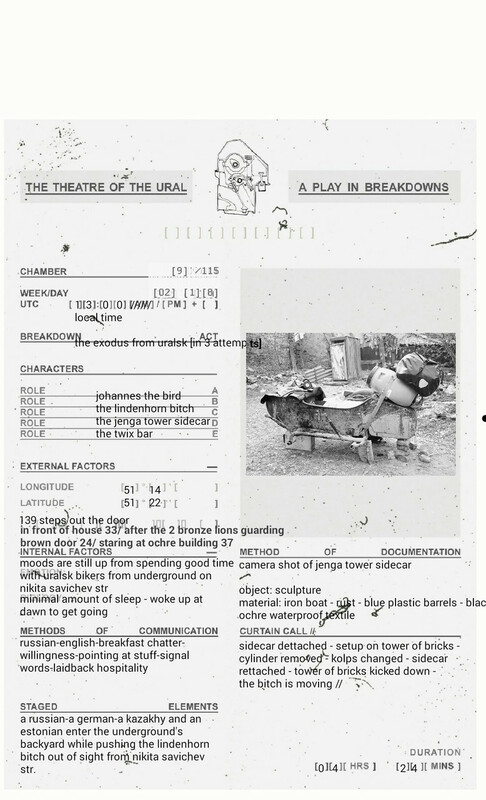 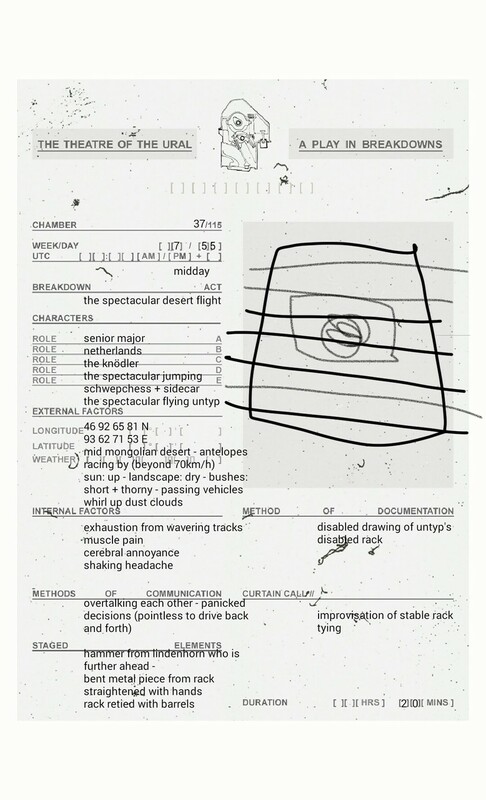 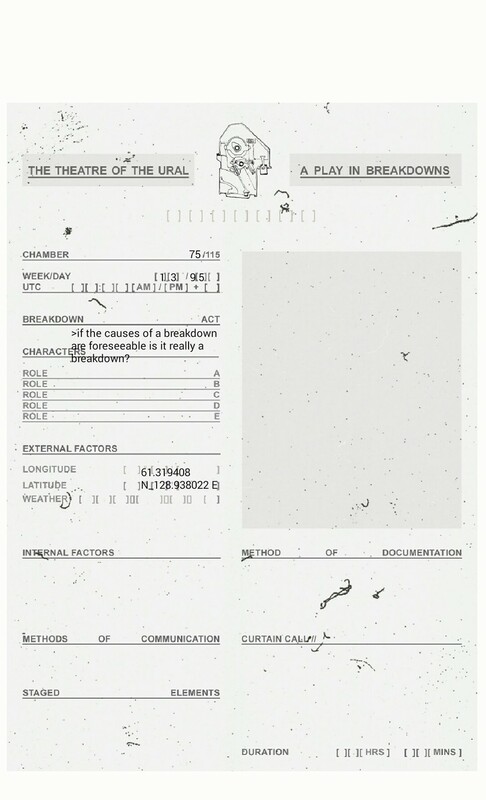 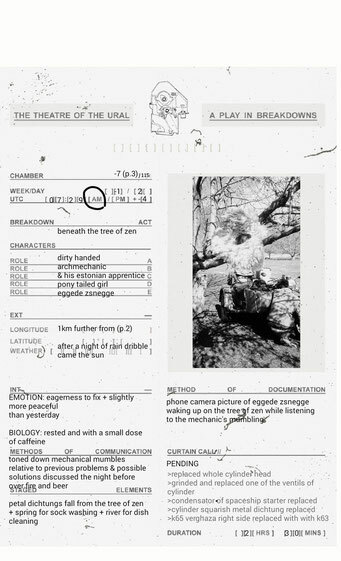 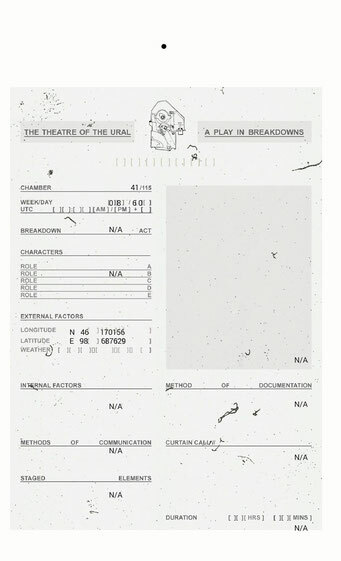 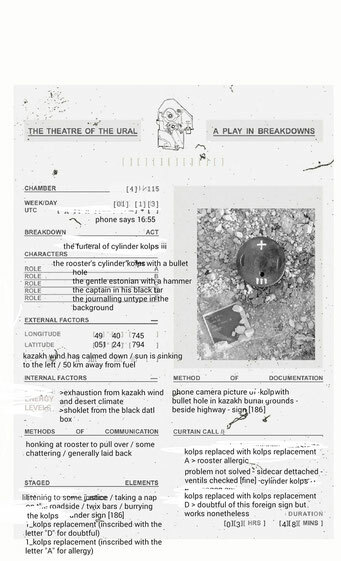 >The drafted form aims to intervene with the pattern of our breakdowns while putting mechanical and passive attributes of the ‘routine’ through hybridized frames of context. 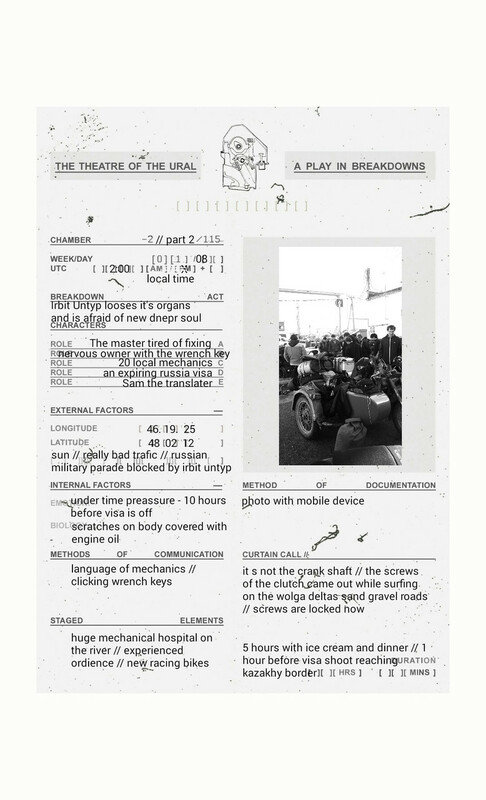 In this light we see our breakdowns as a frame for play – they create a space for us to find way of understanding, rationalizing and communicating mechanical problems in order to move forward. 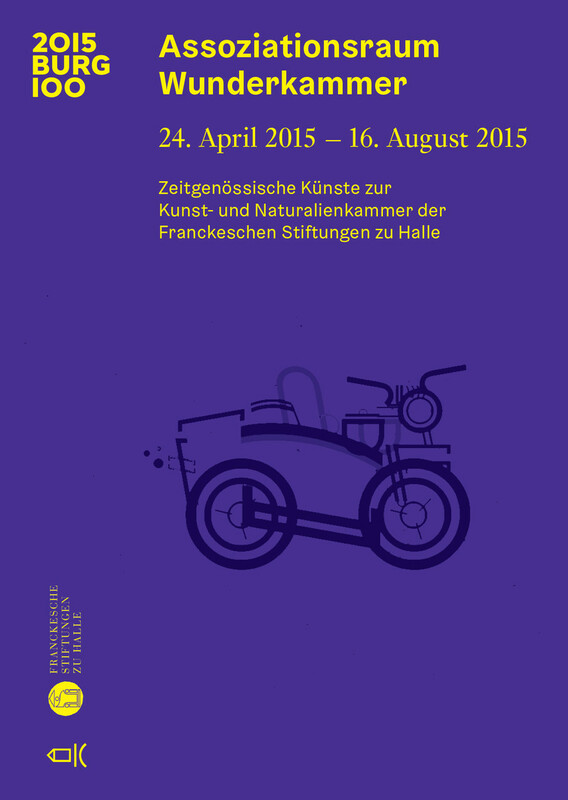 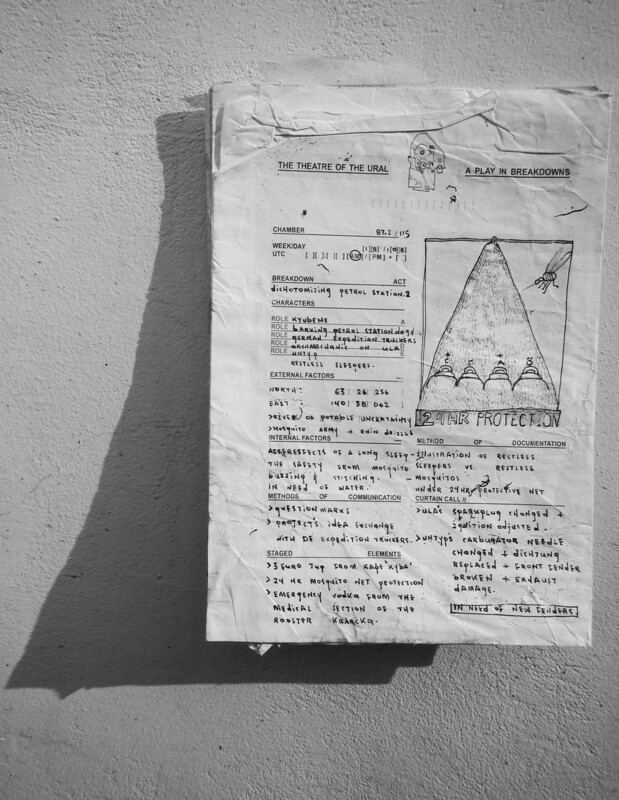 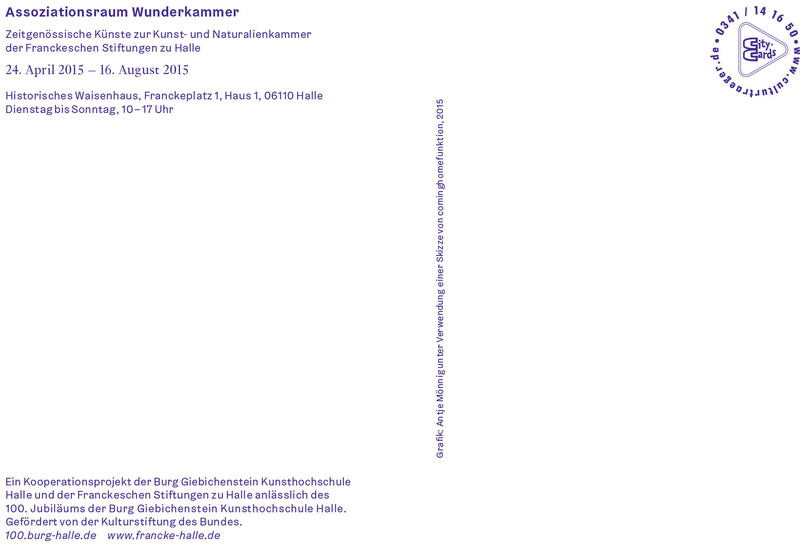 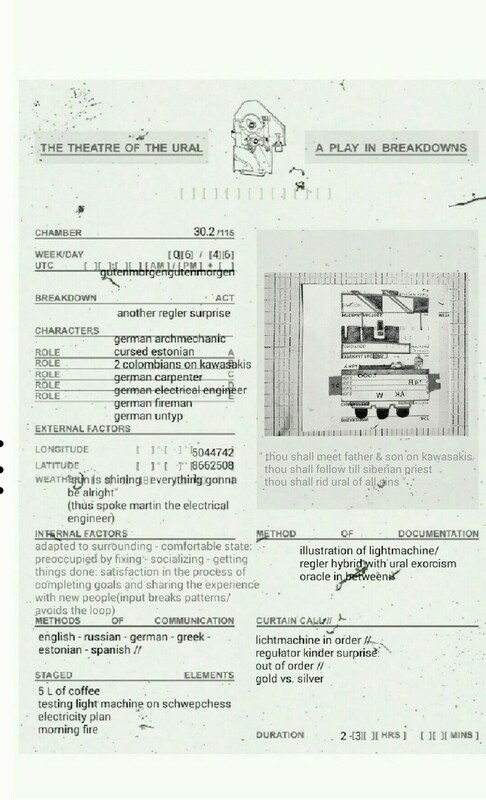 >The work you are currently viewing is in live correspondence with the Frankesche Stiftungen. 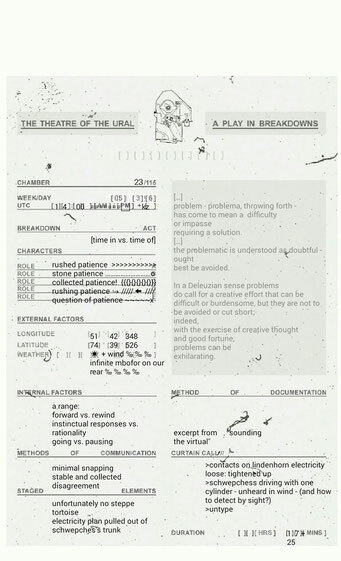 Every breakdown that occurs to restrict our movement becomes an opportunity for the creative process and research to respond. 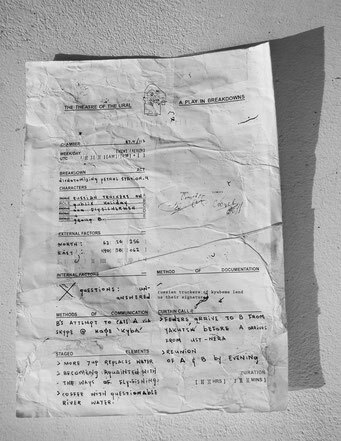 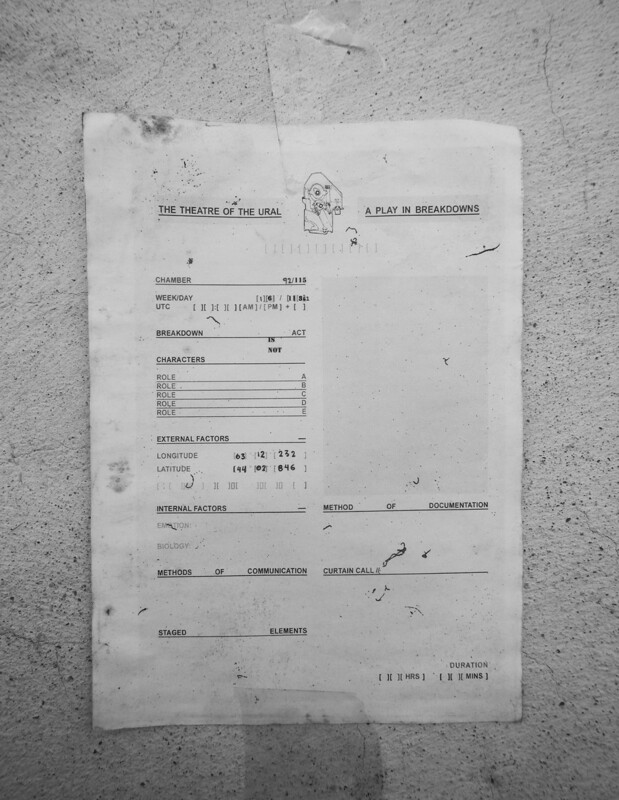 Filling in our self-inflicted bureaucratic forms has become an active part of our daily mobile routine and therefore draws a constant parallel with the daily bureaucratic routines experienced in our stable home base. 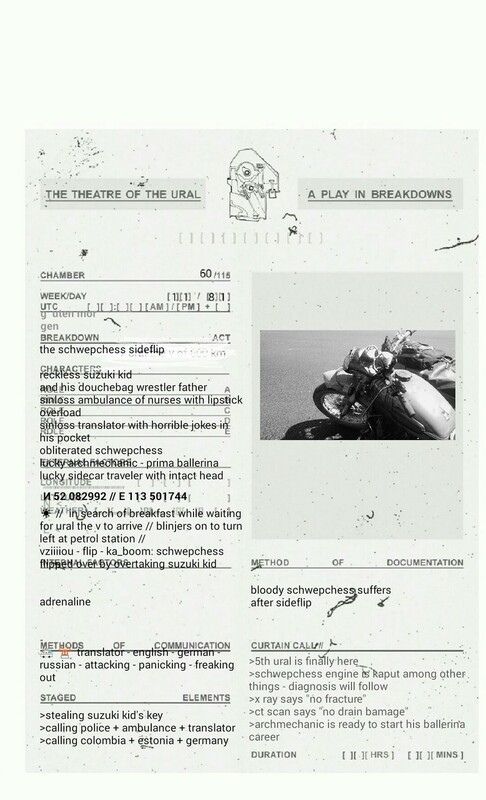 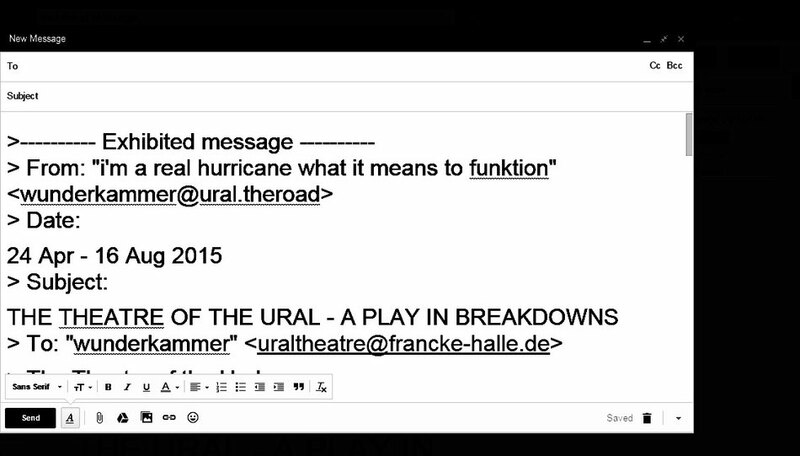 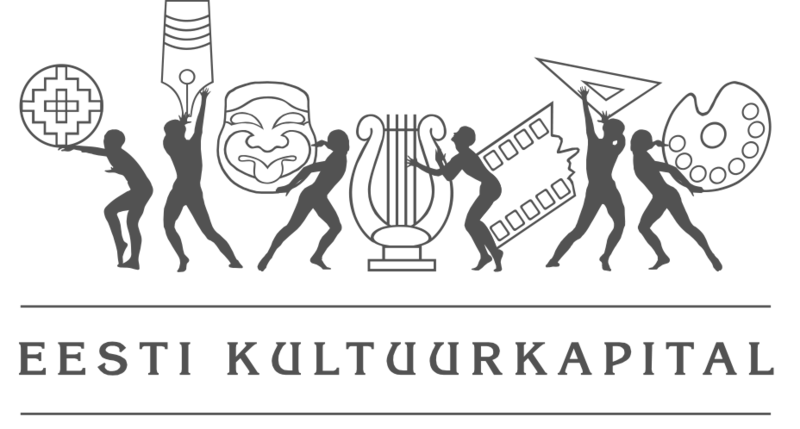 Everyday the Wunderkammer receives an email at uraltheatre@francke-halle.decommunicating the data of our latest breakdown. 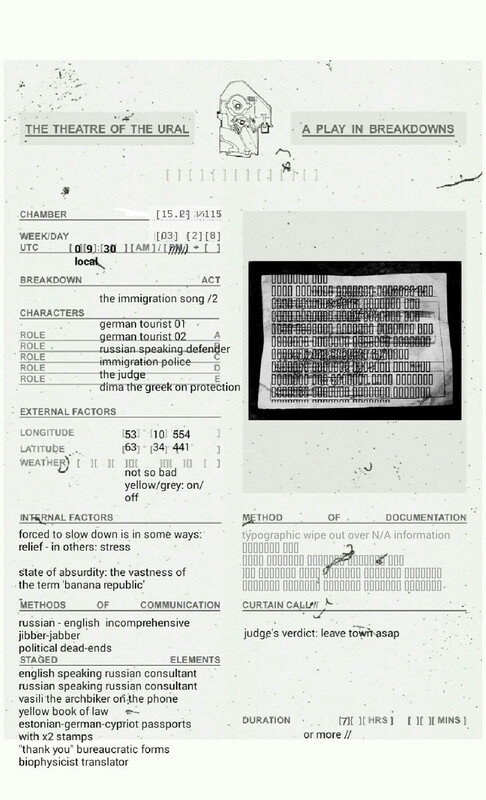 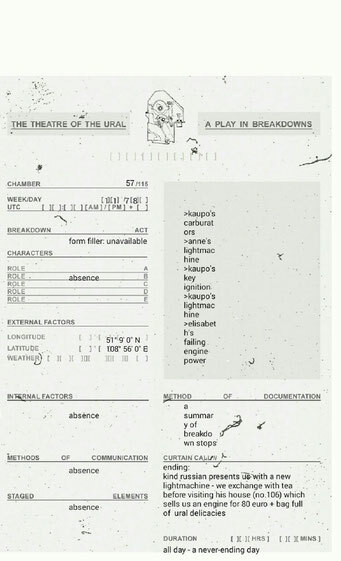 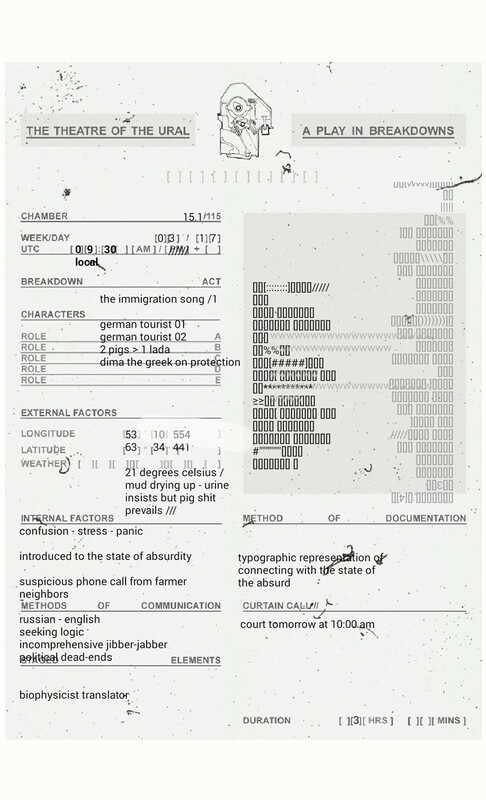 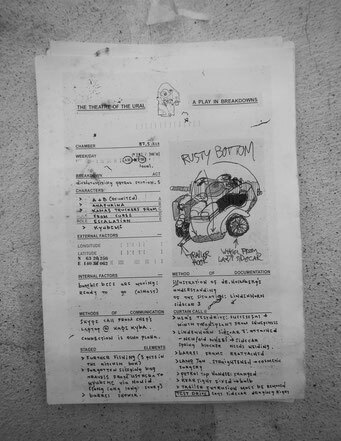 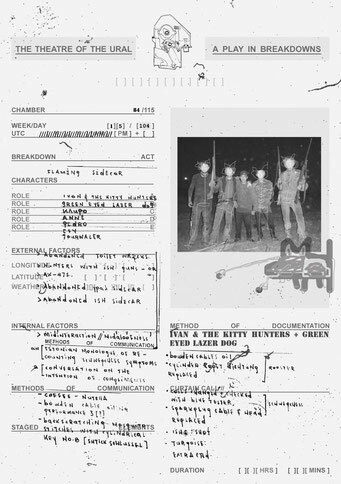 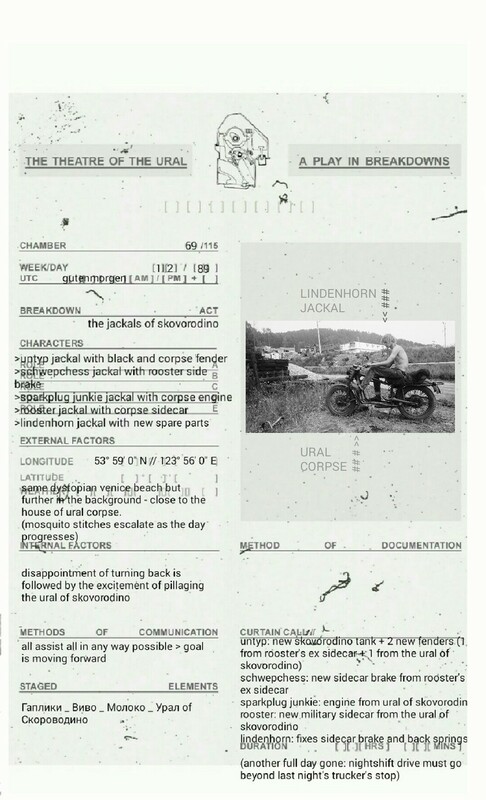 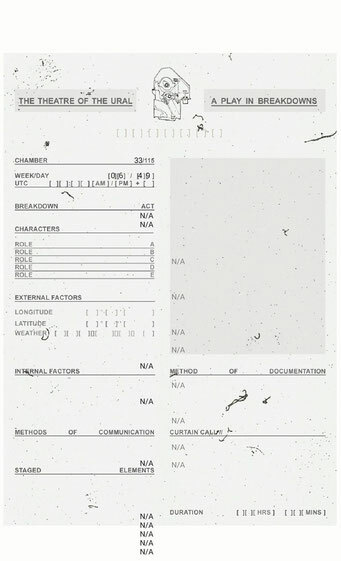 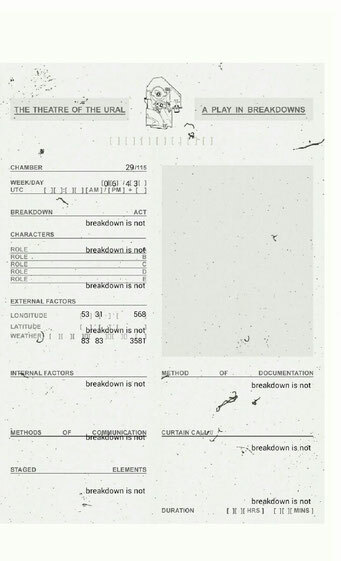 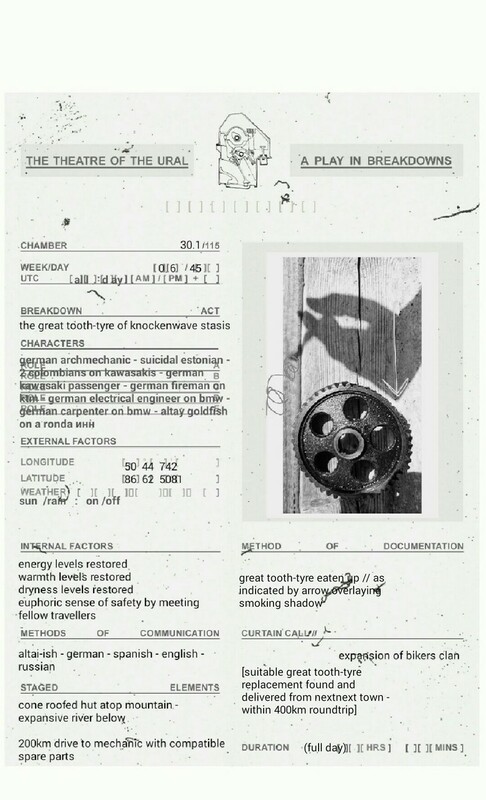 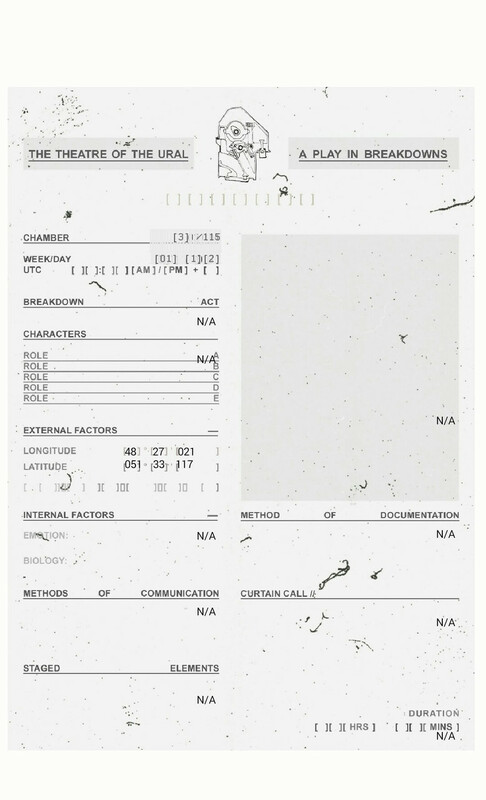 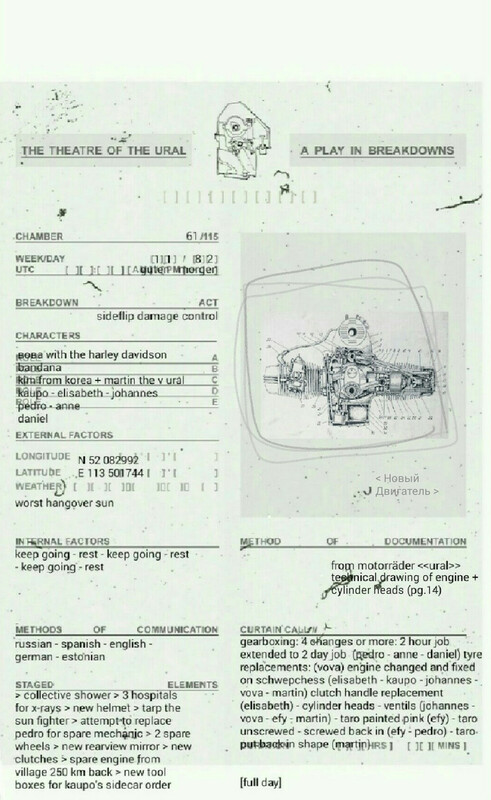 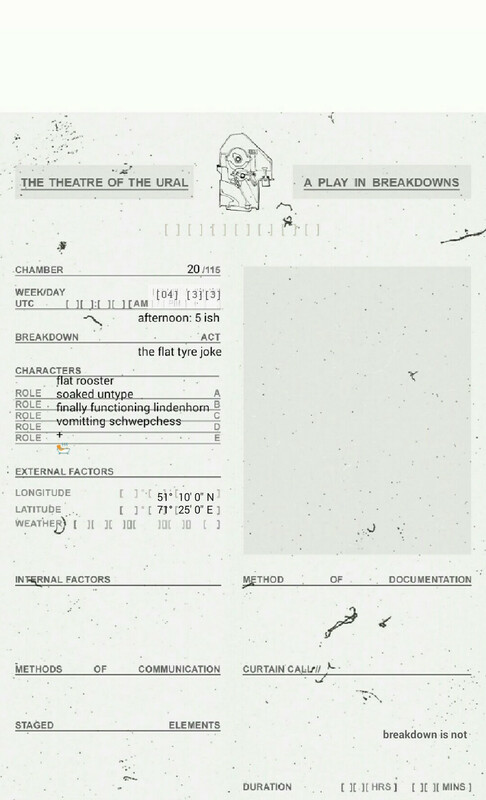 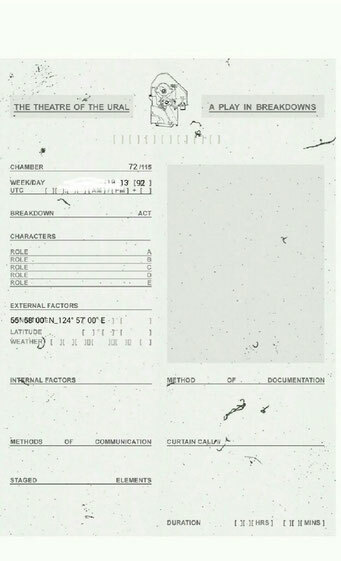 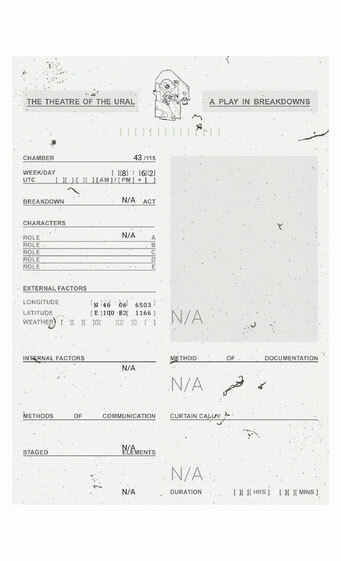 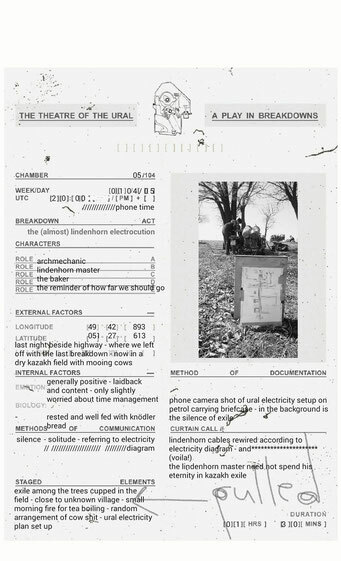 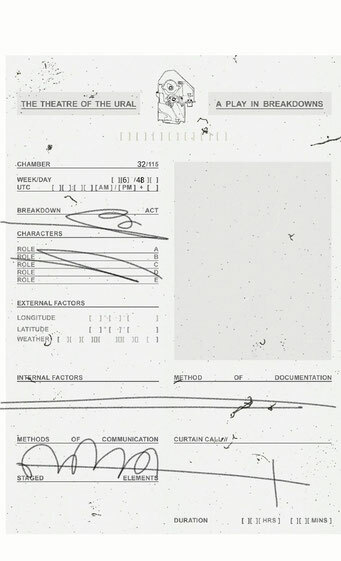 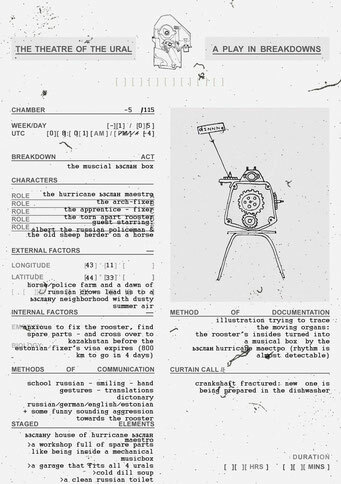 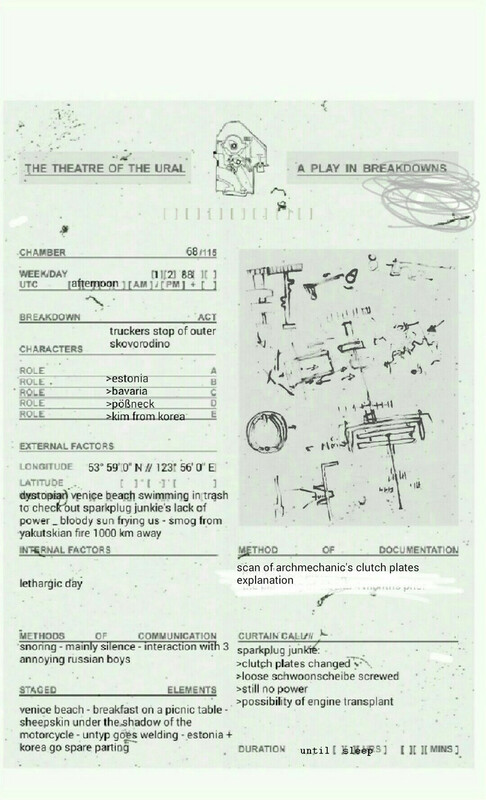 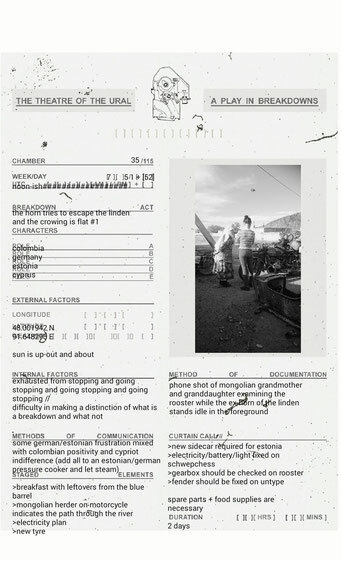 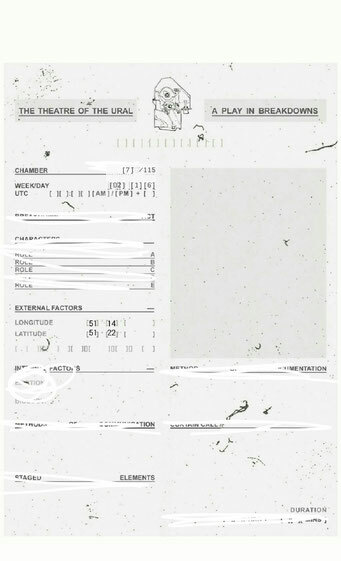 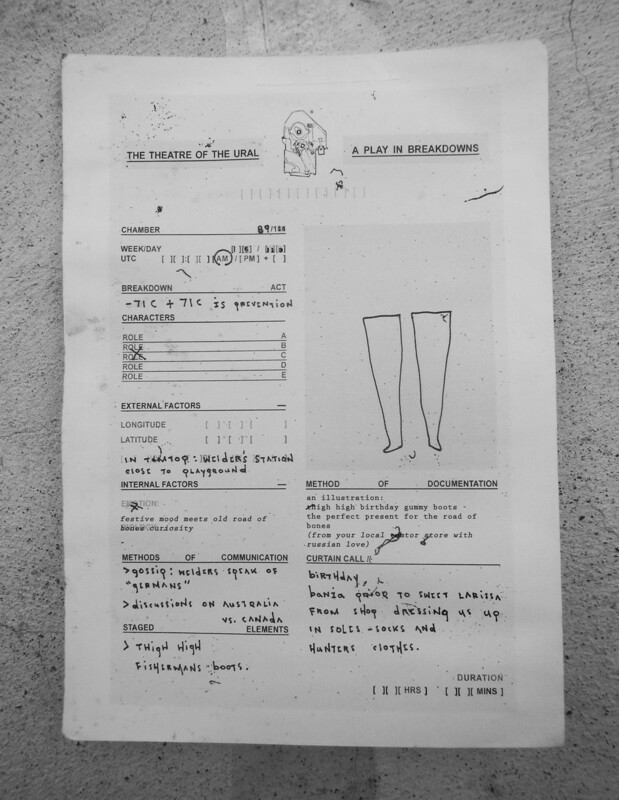 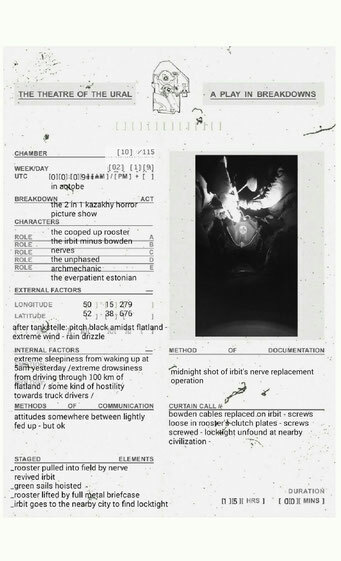 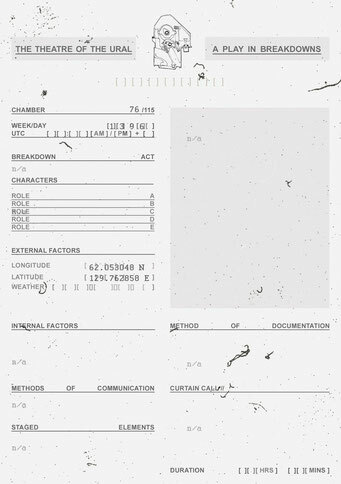 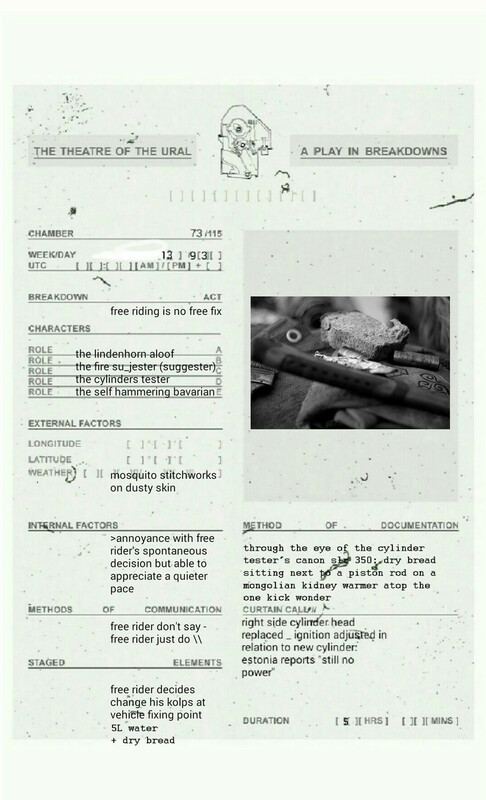 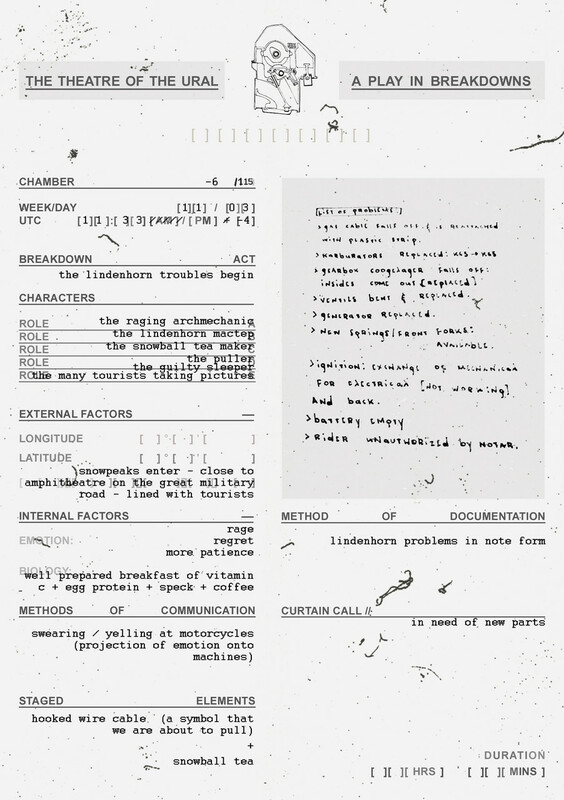 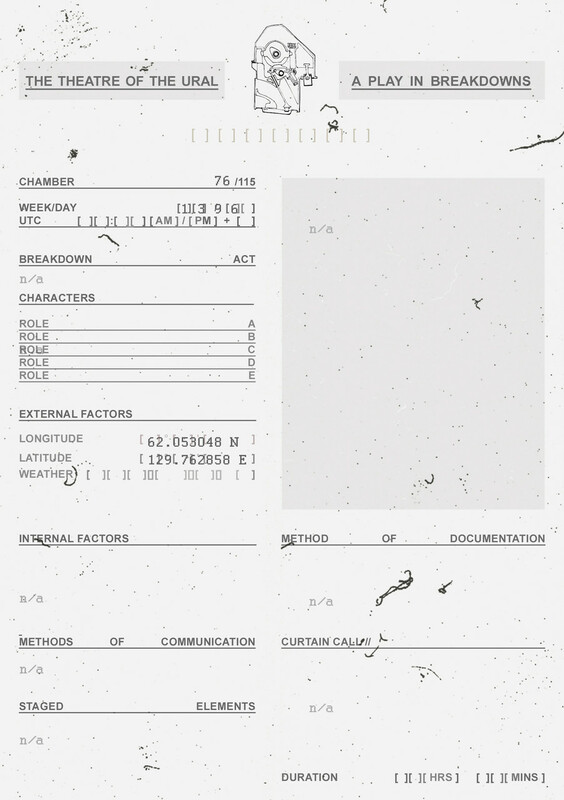 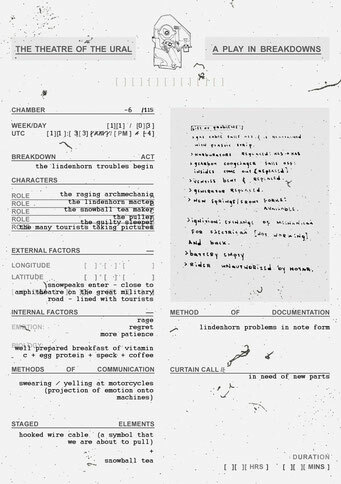 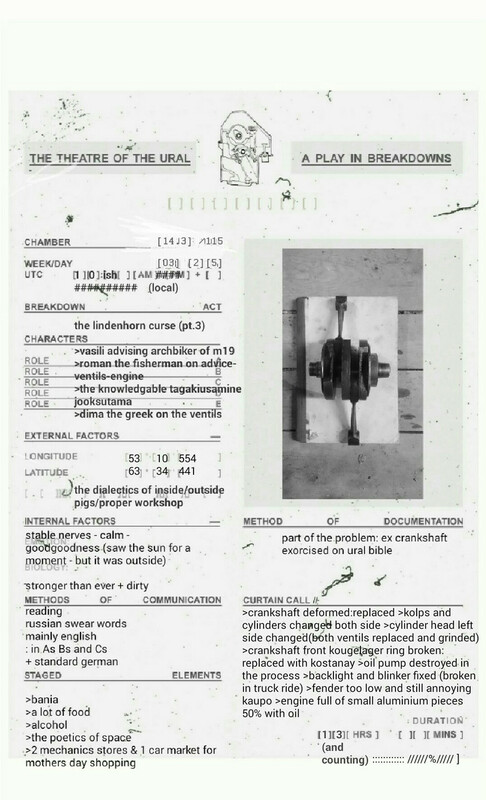 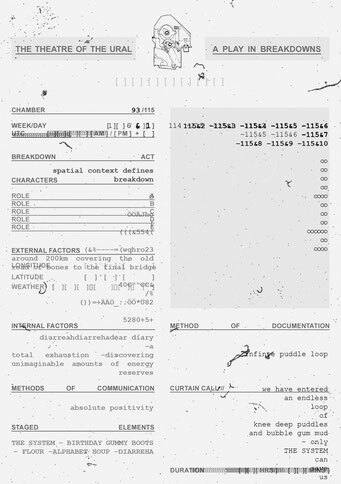 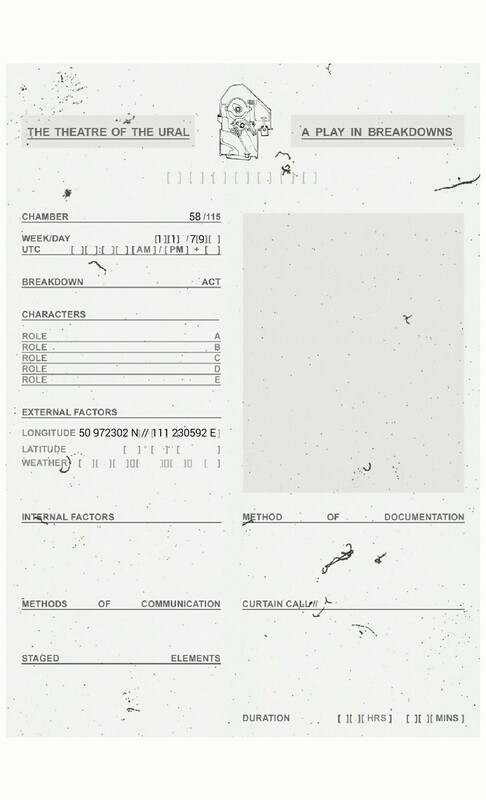 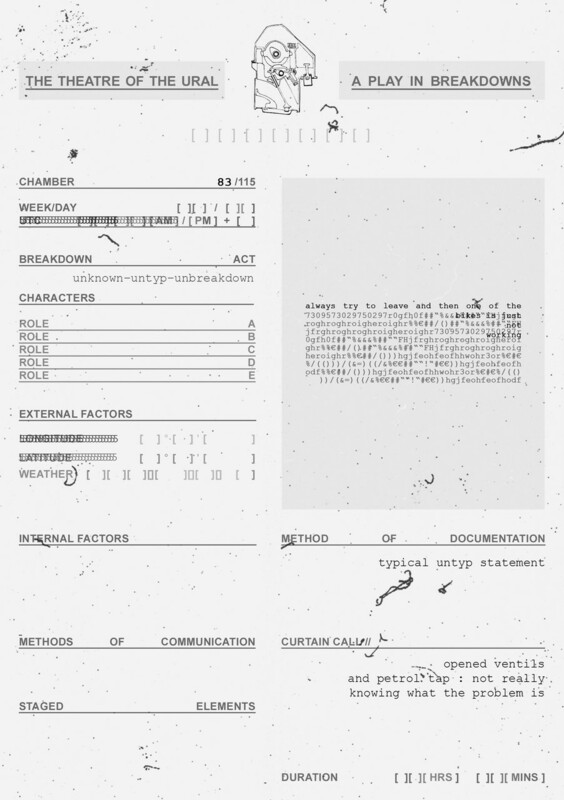 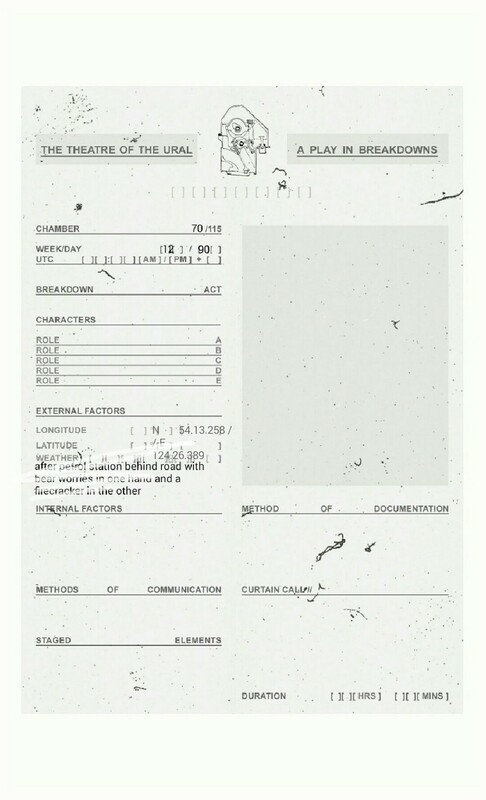 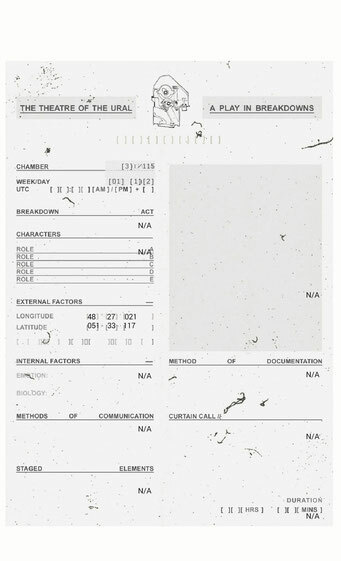 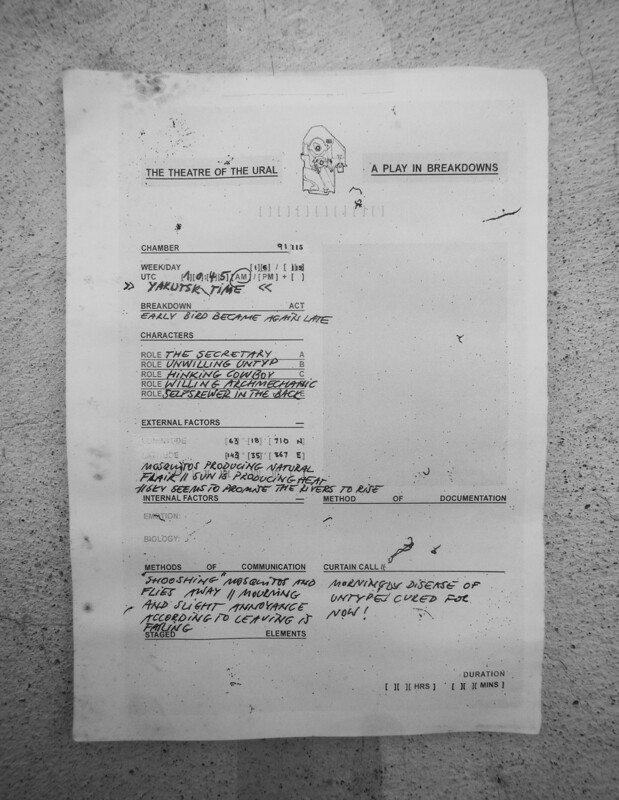 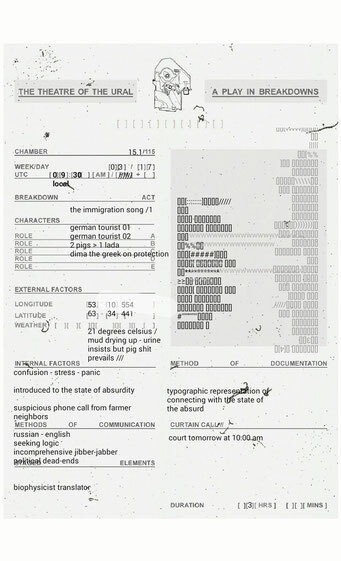 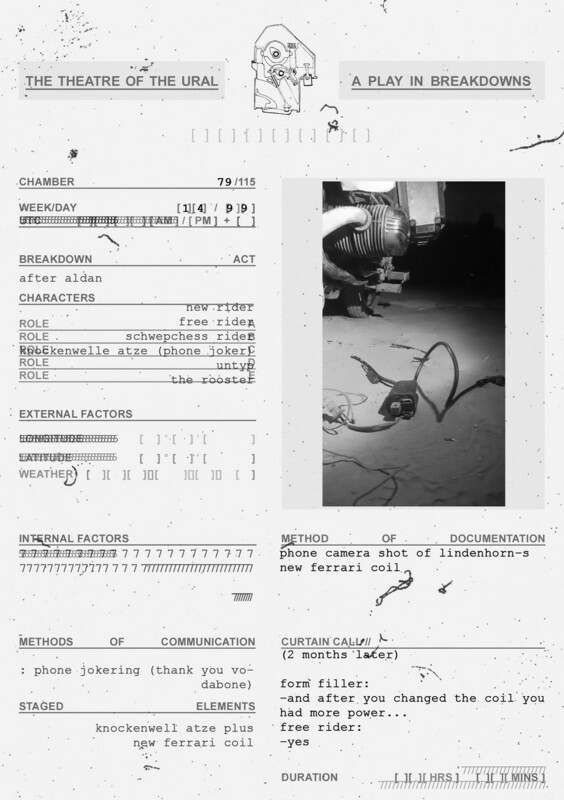 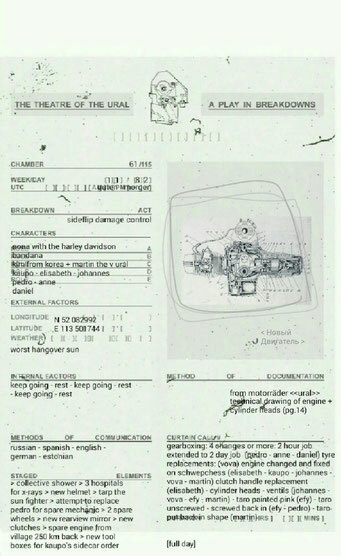 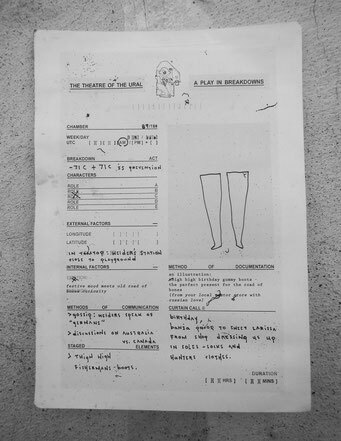 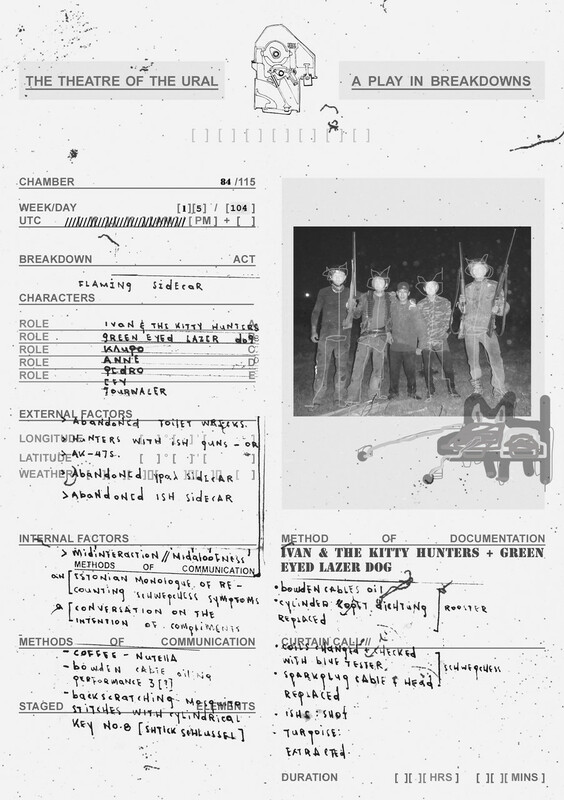 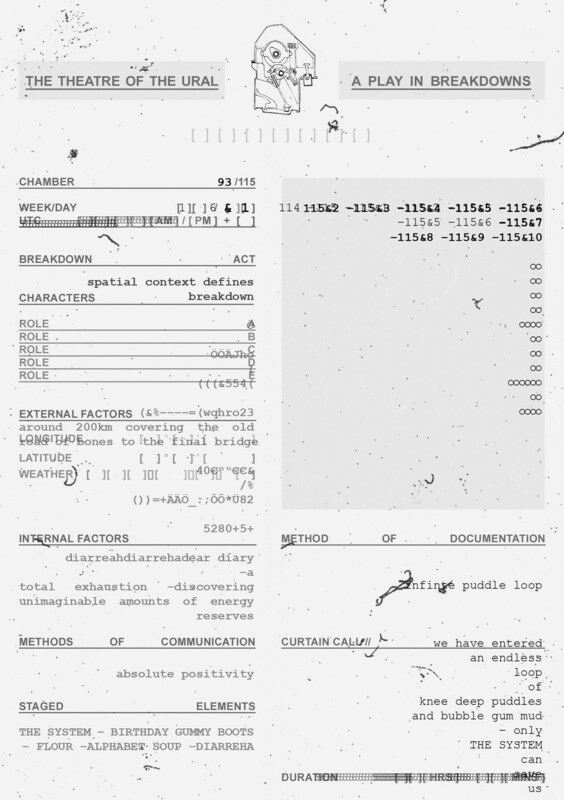 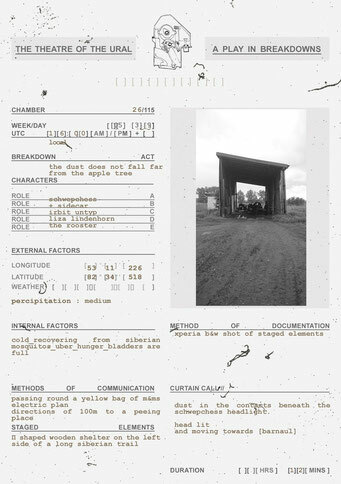 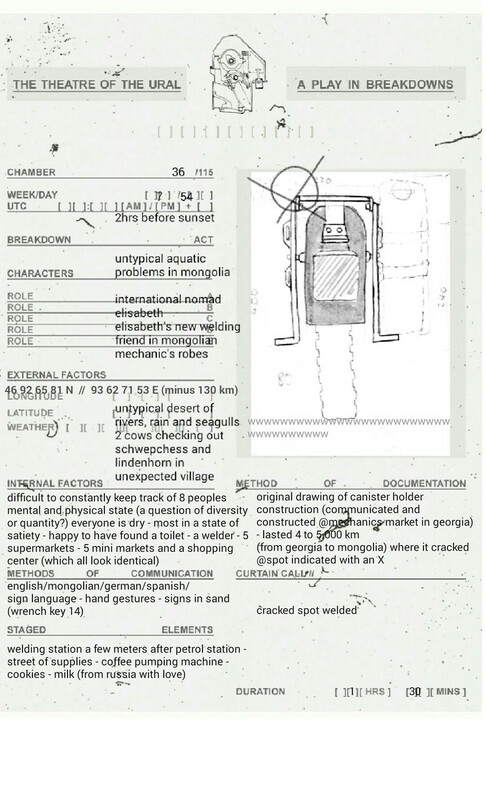 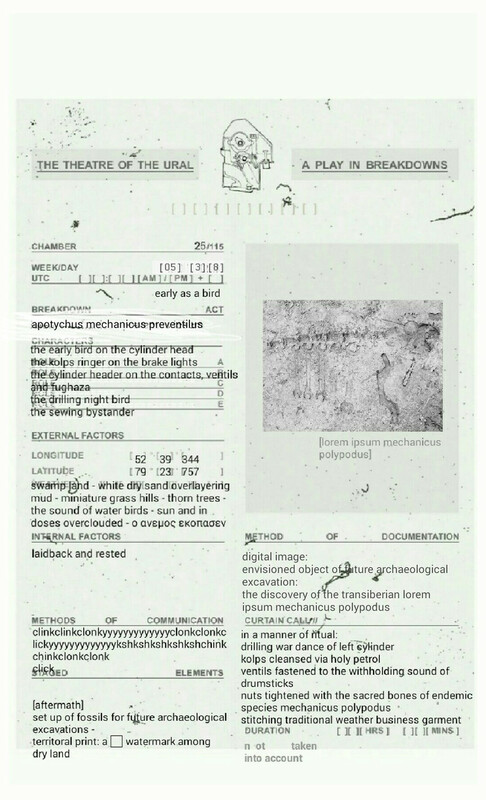 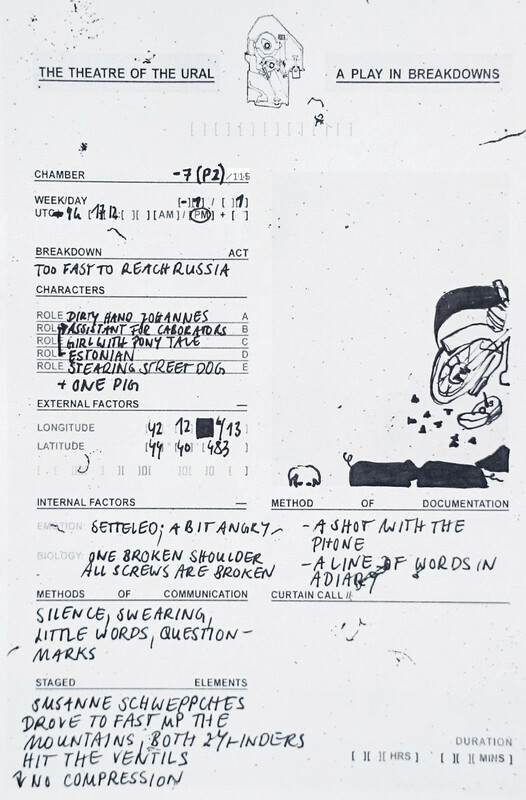 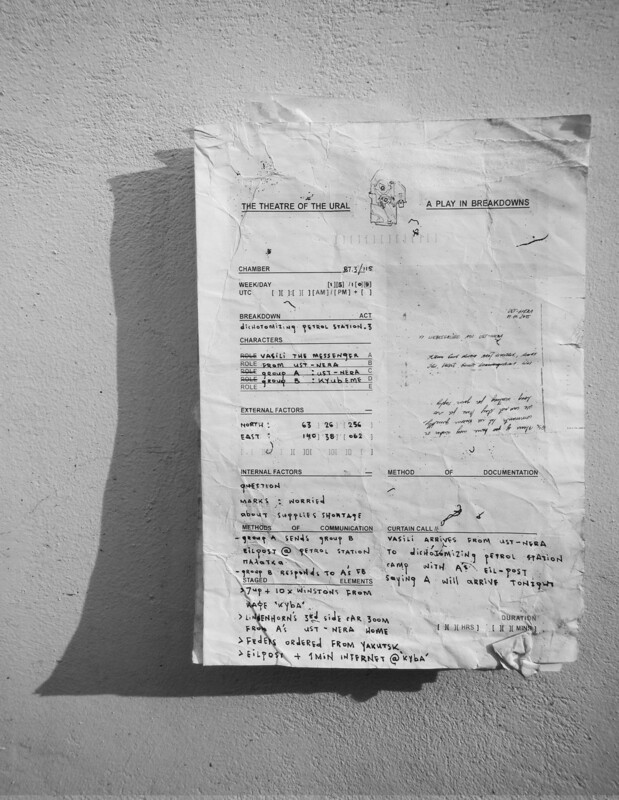 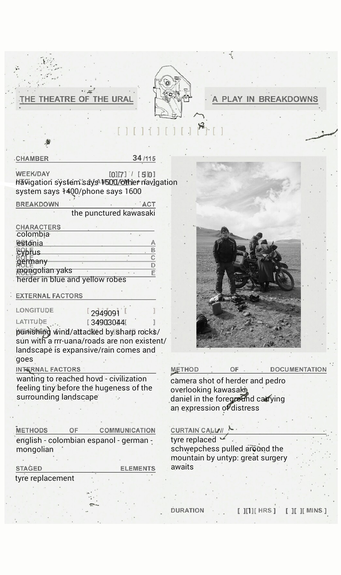 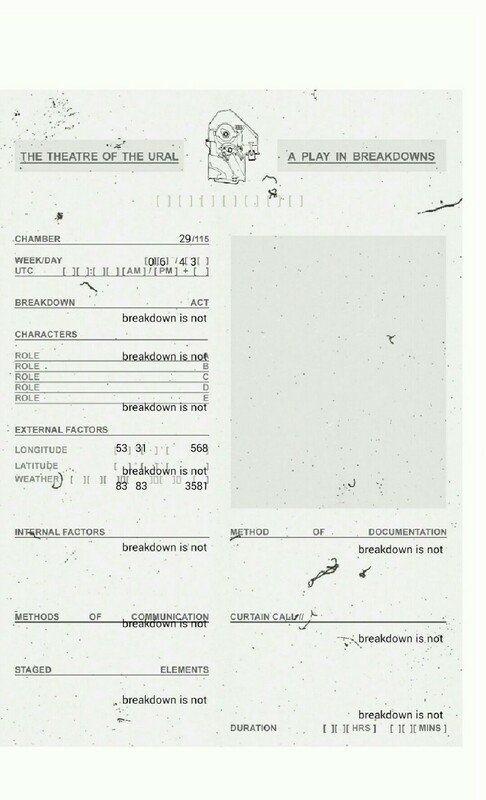 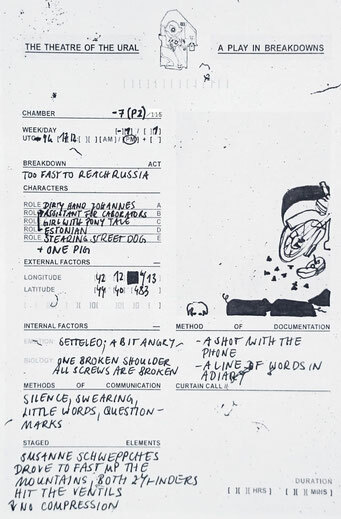 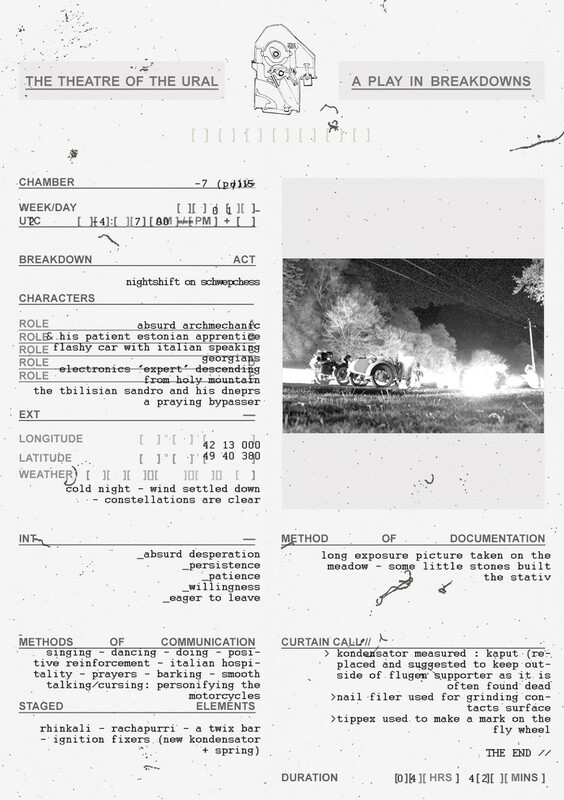 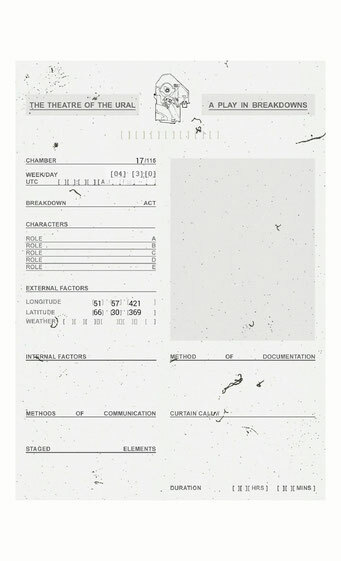 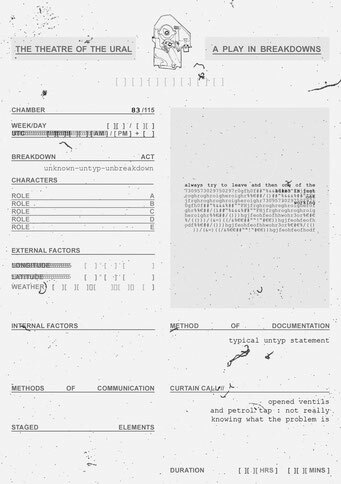 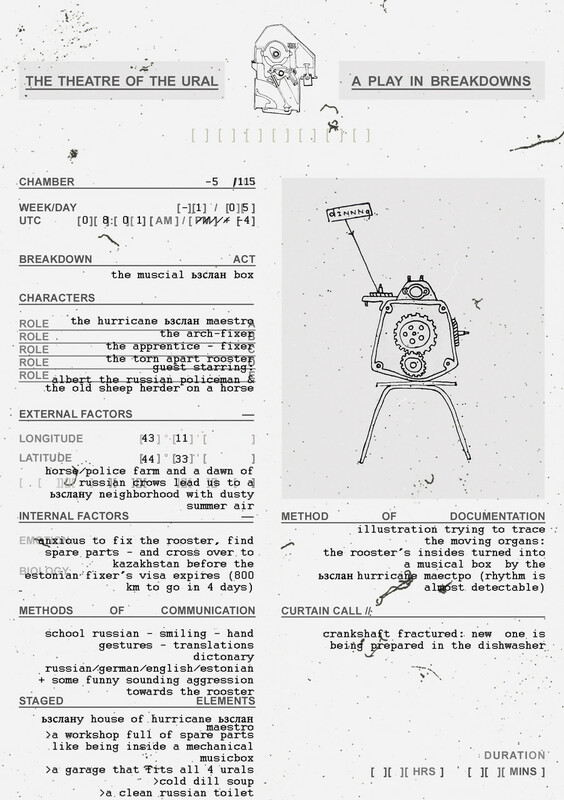 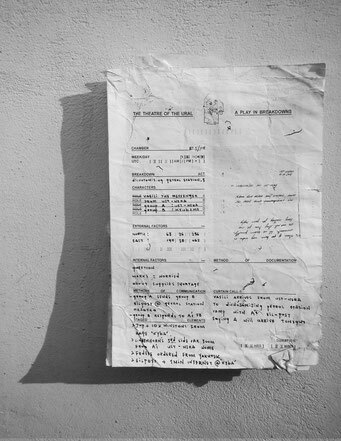 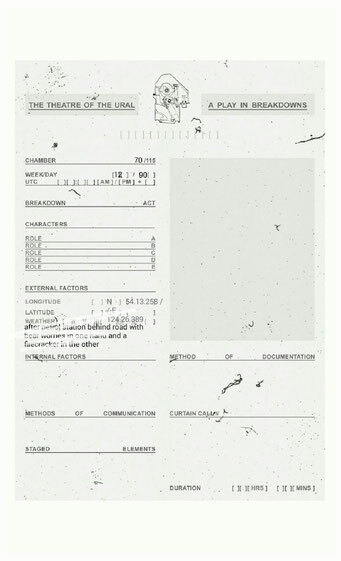 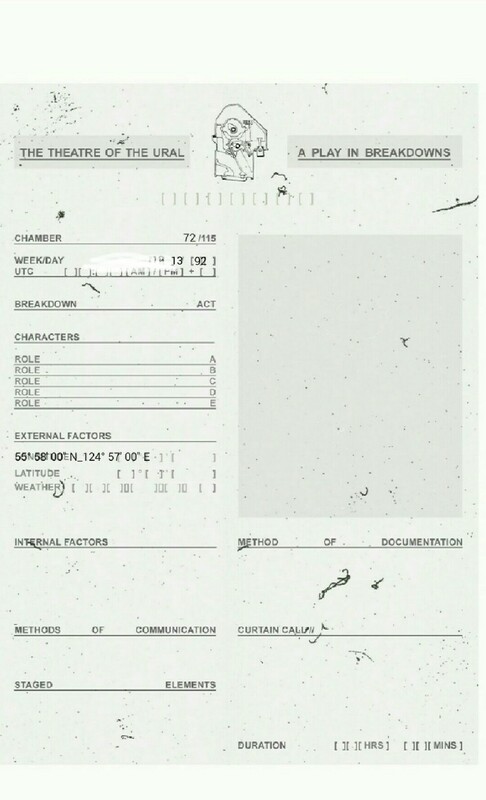 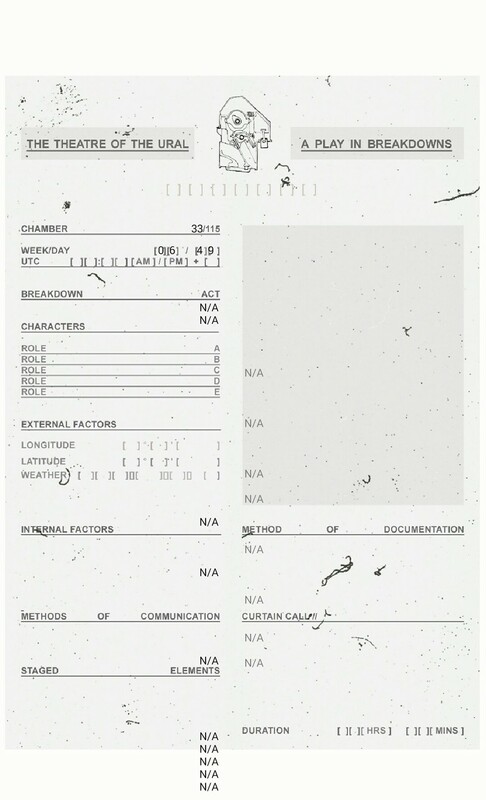 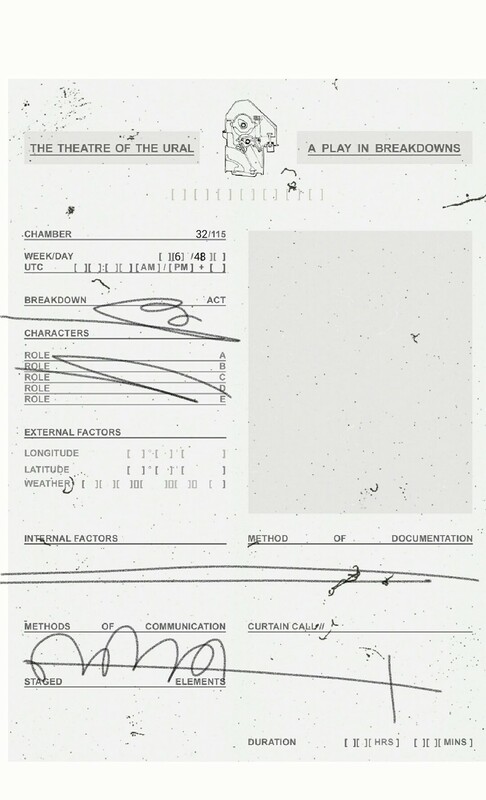 The assessment form indicating the coordinates of our breakdown is then printed, signed and positioned by Wunderkammer officials along the map’s lines of longitude and latitude. 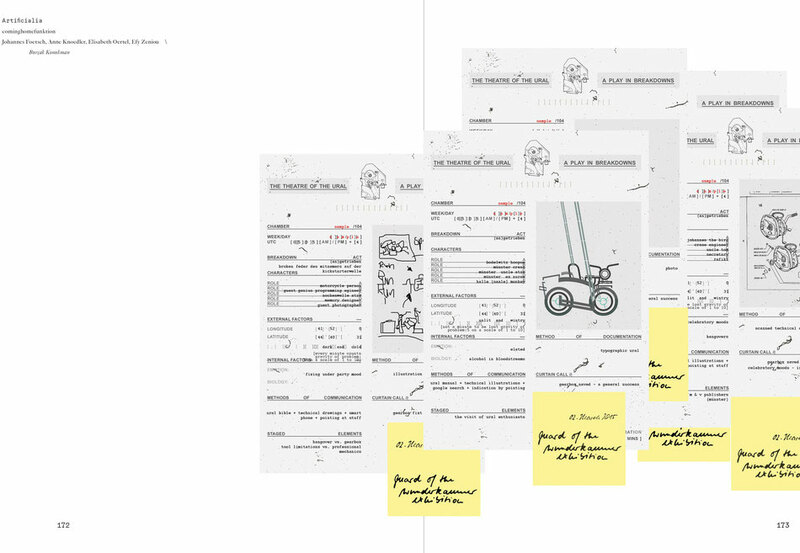 Over the course of the following 3 months at the Frankesche Stiftungen you will be able to witness the expansion of our route with every breakdown form added to the Wunderkammer's inbox.